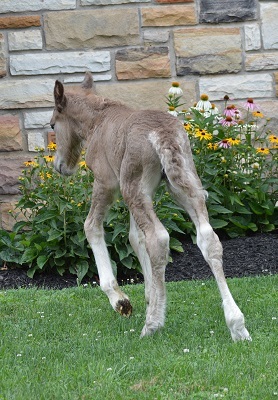 Well it's Official, our new little Gypsy filly born 7/12/17 is Black Silver Dapple and carries red! 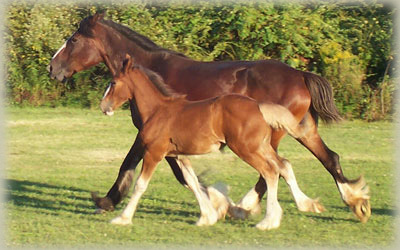 (E/e, a/a, n/Z, n/W20). 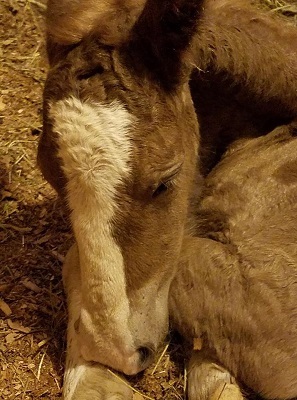 We have named her "Chestnut Oak's Royal Hot Cocoa". 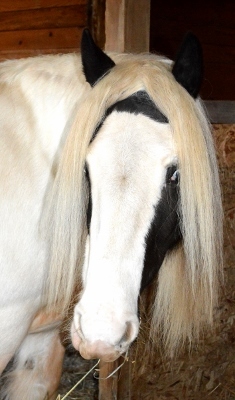 She is gypsy perfection! 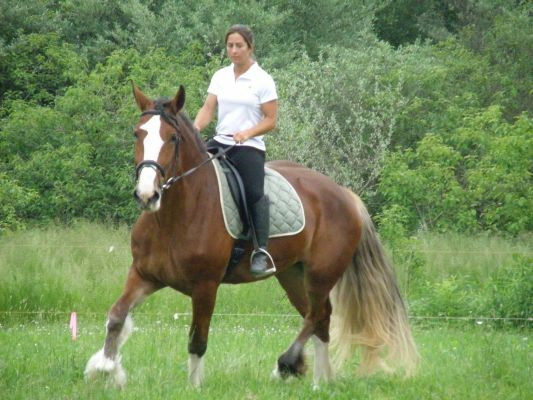 Her sire is GDR Sir Royal RIO Grande, and dam is GHS Summer Night. 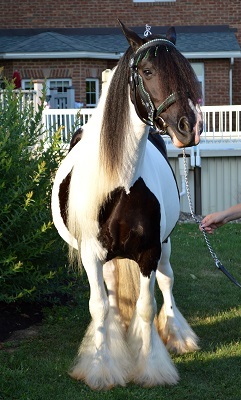 Cocoa has some of the BEST and oldest gypsy bloodlines out there with Sir Royal Excalibur (1st Silver Dapple Gypsy stallion imported to US), Coates Oliver, Billy Boy, Kent Horse, Boss, Roadsweeper, and Coal Horse on sire's side, and Primetime, Lenny's Horse, Ace Horse, Old Paddy Horse, and Bunny Holmes Stallion on dam's side. 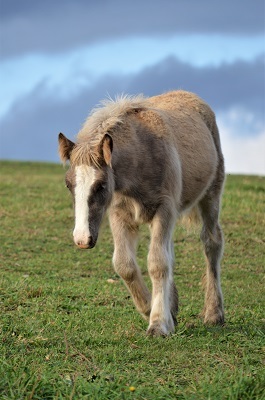 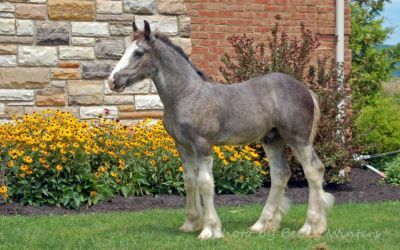 With perfect conformation, showy movement, stunning coloring, and a laid back attitude, this beautiful filly is a keeper for our own breeding program! 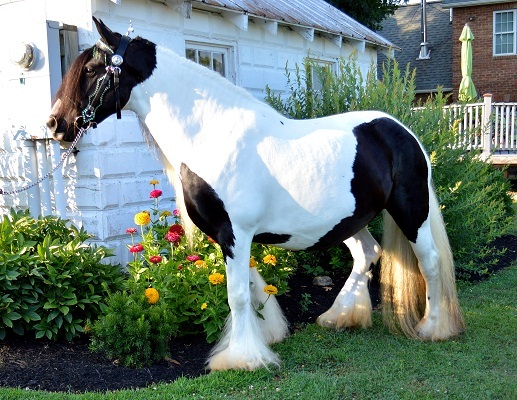 Our beautiful GVHS Gypsy Vanner mare, SWF Blue Iris needs no introduction as she is a double bred "The Gypsy King" and "Cushti Bok" great granddaughter! 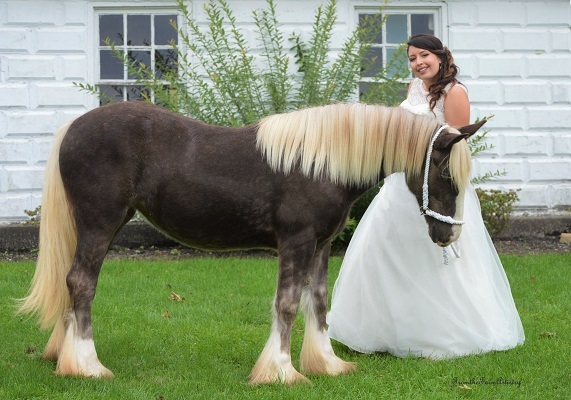 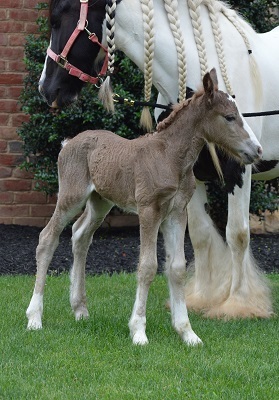 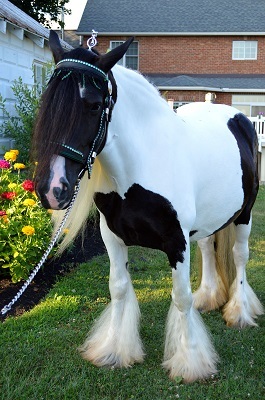 Two of the very 1st Gypsy Vanner stallions to set foot on American soil back in 1996 are in her pedigree! 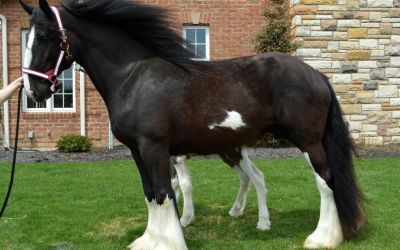 Her sire is VV Deja Blue (Vintage Vanner's Bommarito x Vintage Vanner's Treana) who is owned by Stillwater Farm in North Carolina, and her dam is Harkaway Poppy who was imported from Europe. 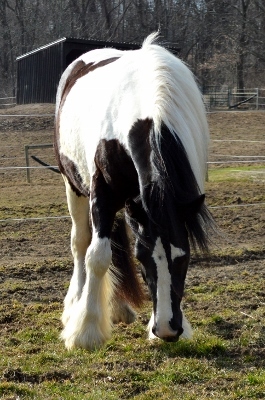 Iris is a huge mare standing 15hh with heavy bone and is as wide as she is tall. 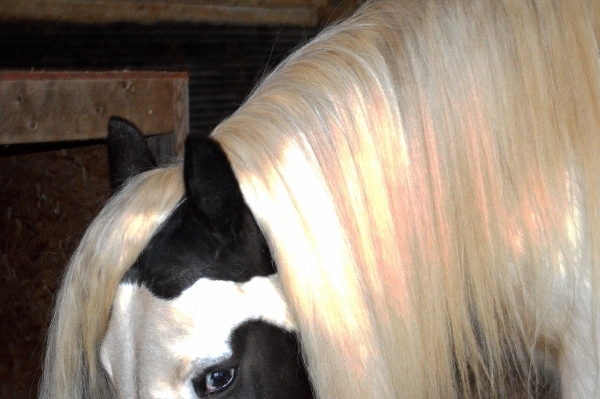 Her flashy markings, nice feathering, kind eye and sweet head really set her apart from the rest. 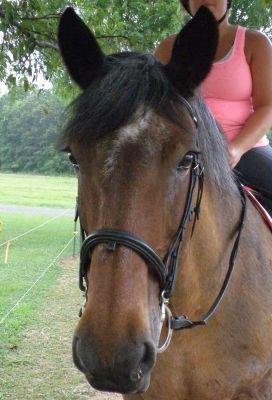 She is very sweet and loves attention. 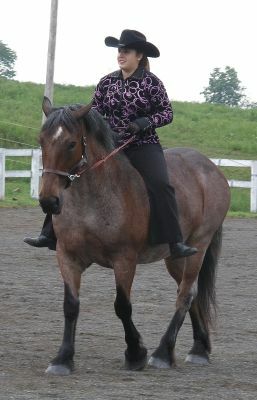 Iris is trained to ride and drive. 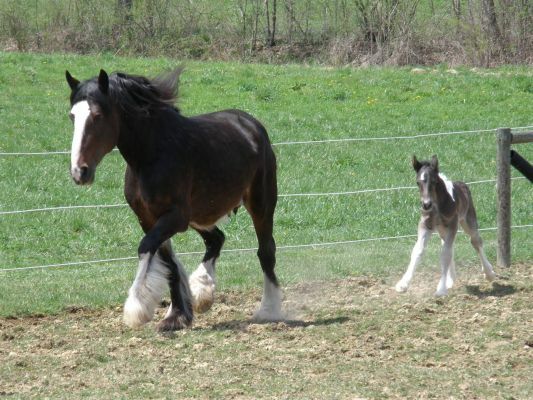 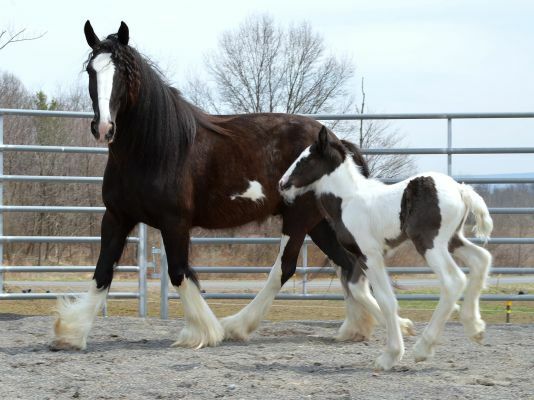 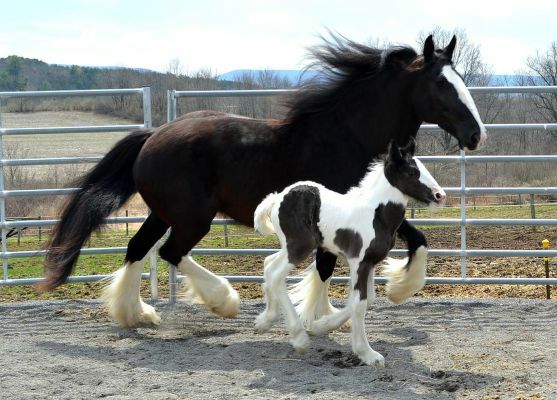 Iris is producing Gypsy Vanner foals with superior quality, fabulous movement, and stunning color! 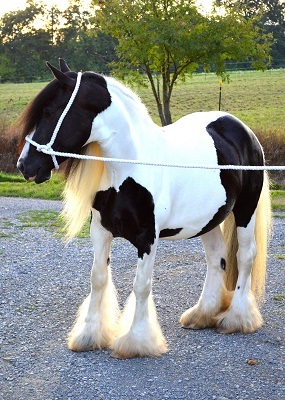 Introducing our Fairytale mare Snow White. 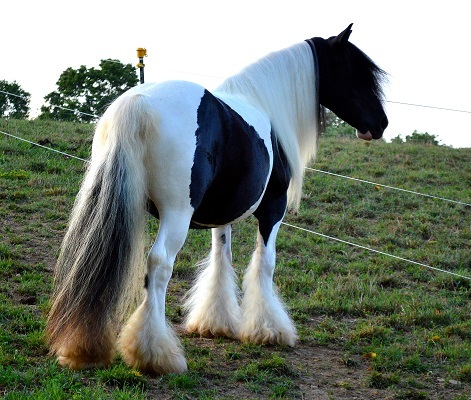 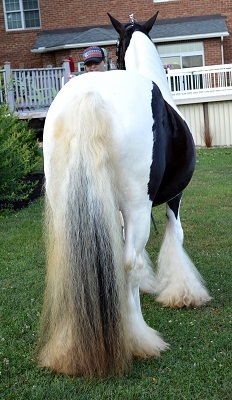 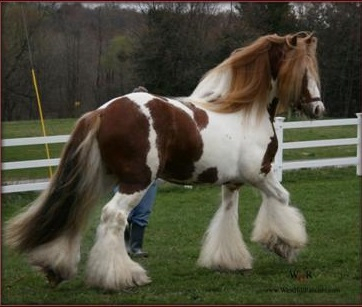 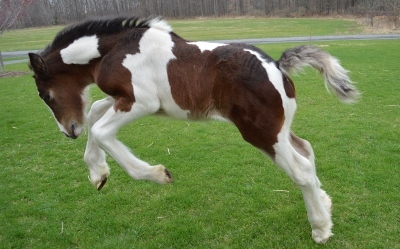 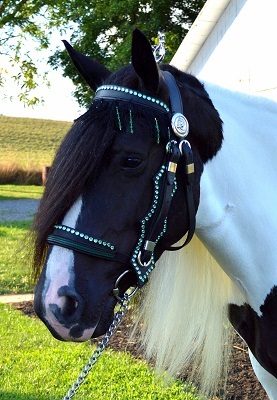 This magical medicine hat pinto colored GVHS registered Gypsy Vanner mare is what dreams are made of. 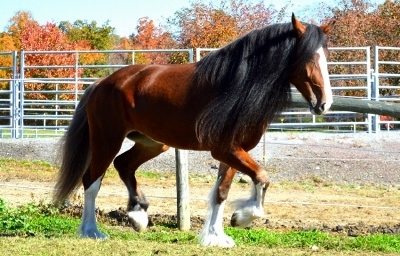 Native American Indians believed that medicine hat horses possessed magical powers and were prized members of the herd. 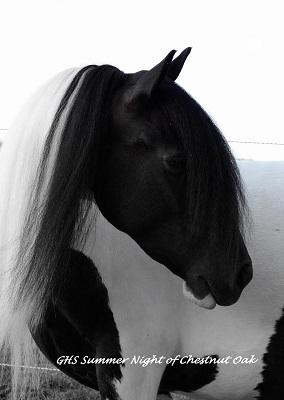 Snow White is a granddaughter of the famous Desert Jewel Lenny's Horse! 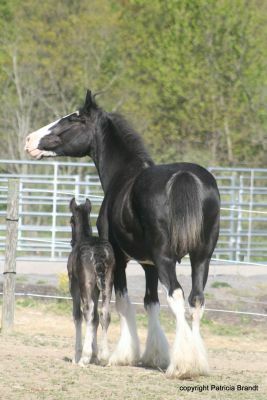 Her sire is the one and only Silky Boy (Lenny's Horse x Daughter of Dulux Horse) and her gorgeous dam is Long Mane Mare (The Ace Horse x Bunny Holmes Good Mare). 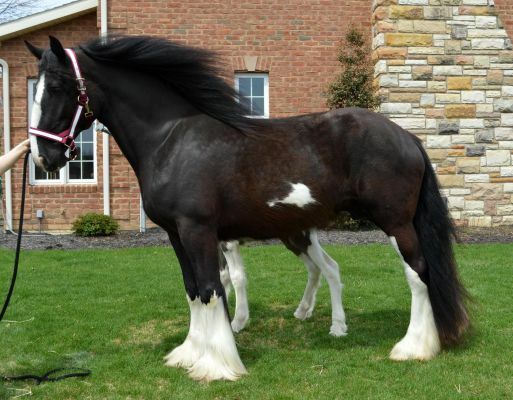 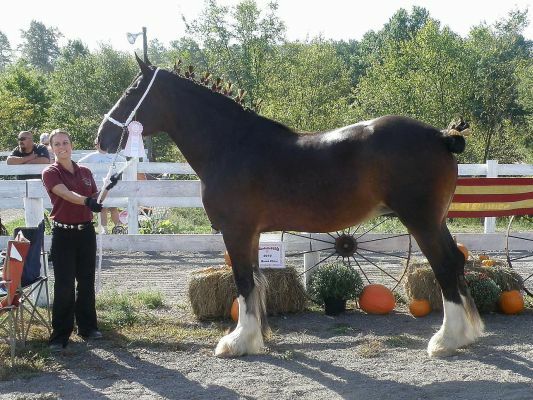 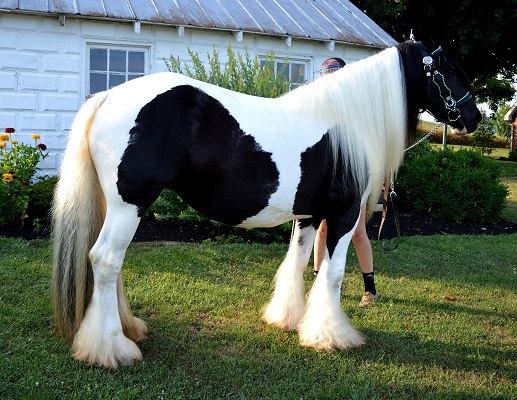 This striking mare stands at 14.3hh, has super thick and silky feather, mane, and tail, perfect cob conformation, and a stunning presence to match. 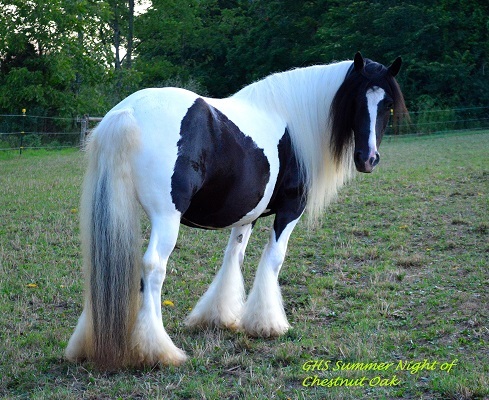 Chestnut Oak Farm proudly presents our beautiful GVHS registered Gypsy Vanner mare GHS Summer Night. 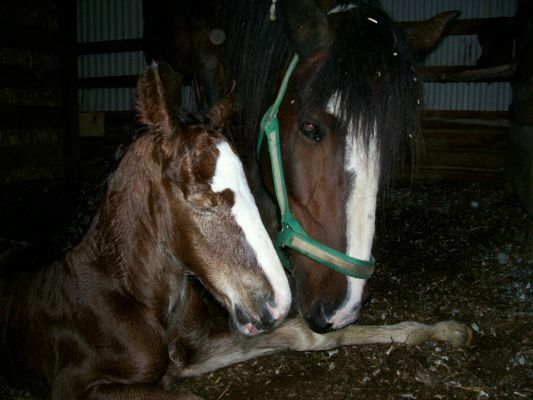 This adorable and sweet lady has some of the greats in her pedigree! 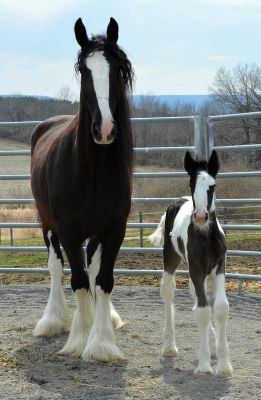 Sired by the magnificent and heavily feathered chestnut tobiano stallion Prime Time, who is by the famous Desert Jewel Lenny's Horse, going back to The Lob Eared Horse and Wiltshire's Black & White Stallion. 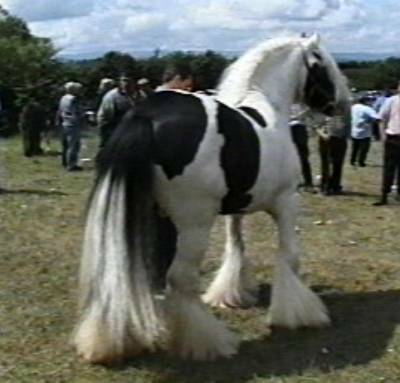 Summer's dam, Long Mane Mare is by The Ace Horse out of Bunny Holmes Good Mare, with lines going back to Old Paddy Horse and The Coal Horse. 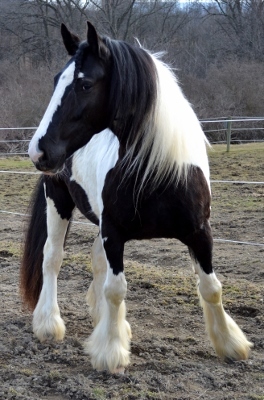 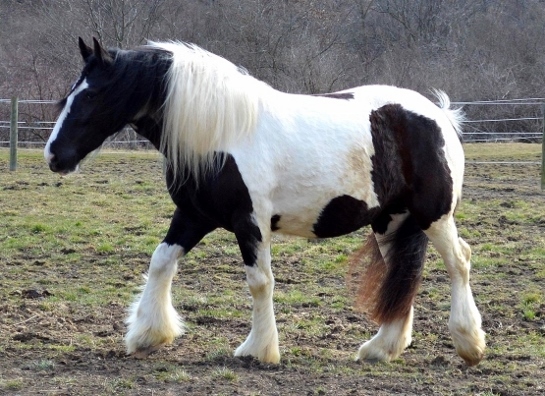 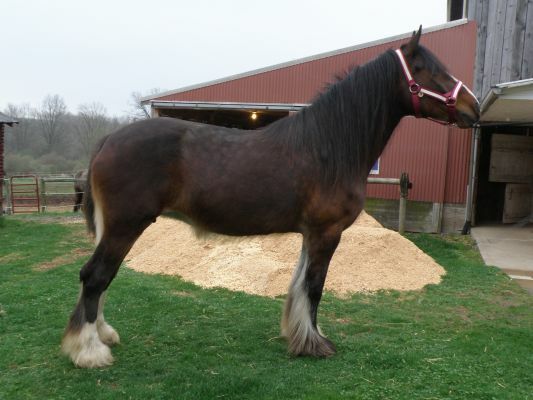 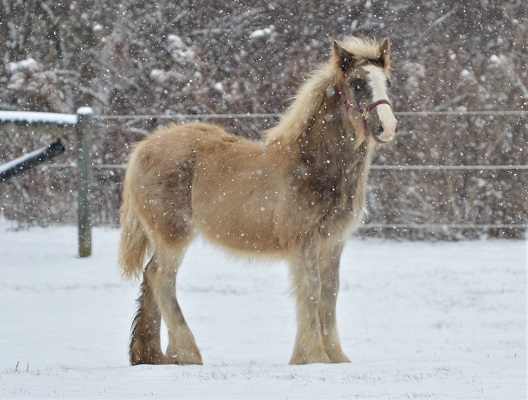 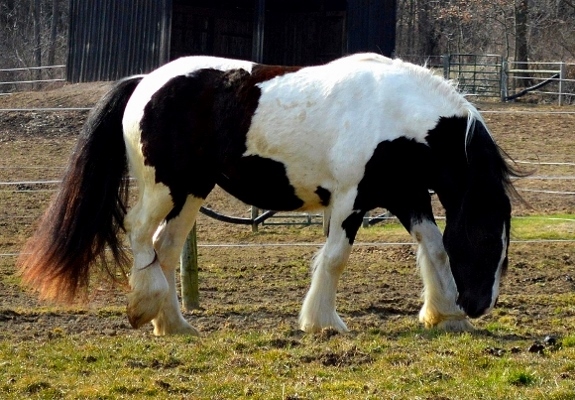 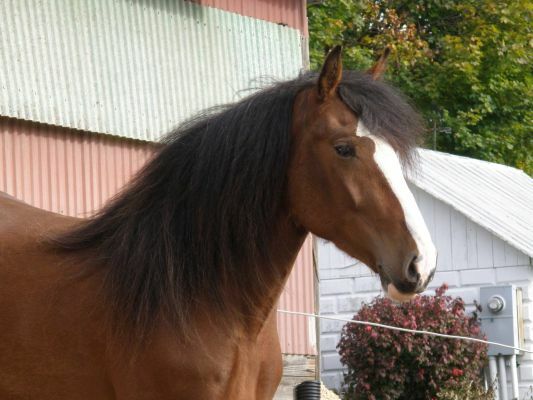 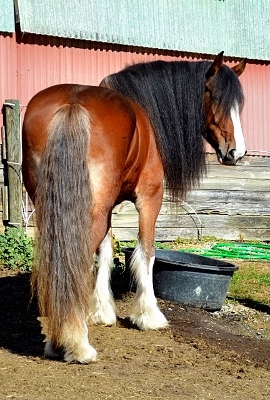 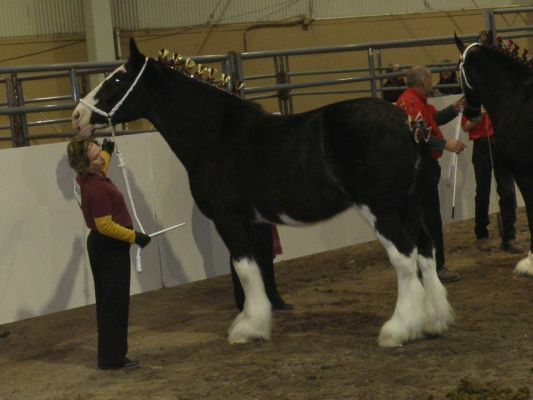 Heavy build, with proper cob conformation, massive feathering, flashy pinto markings and a mane almost to her knees, she stands at 14.2hh. 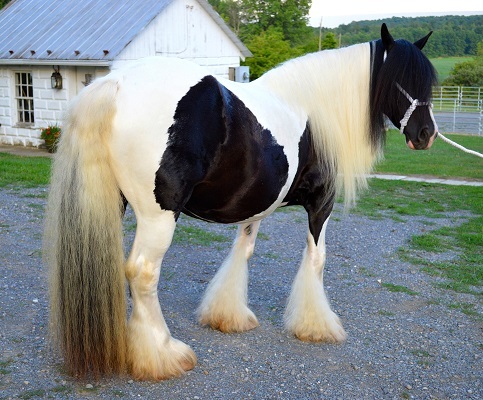 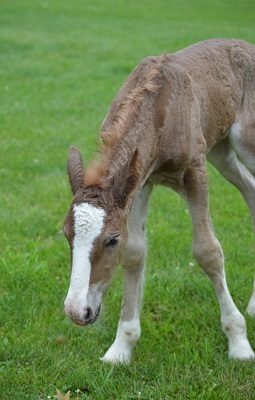 Summer is producing Gypsy Vanner foals with above average quality, sweet temperments, and stunning color to boot! 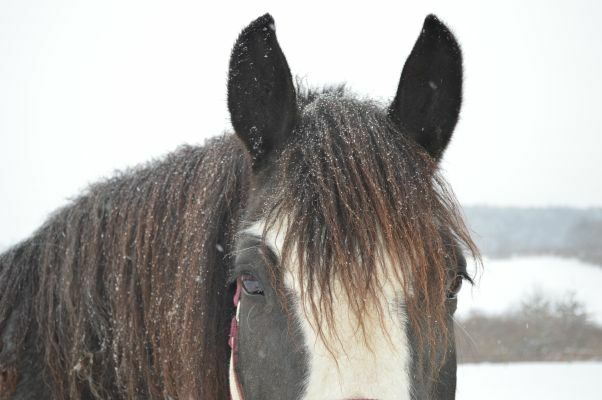 Chestnut Oak's Foxy Hope is a beautiful double registered ASHA and Foundation IDHA registered Shire mare, and she is just that, extra foxy with charisma to spare! 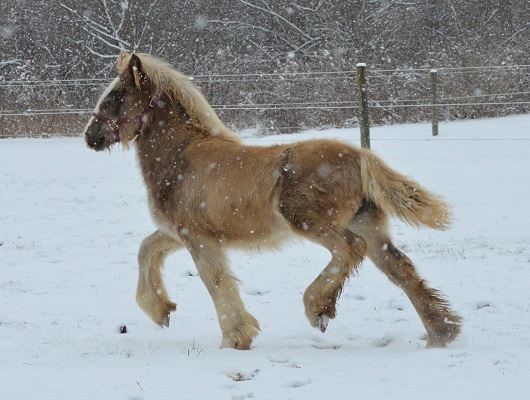 She is a rare colored bay with flaxen tail and also carries a red gene! 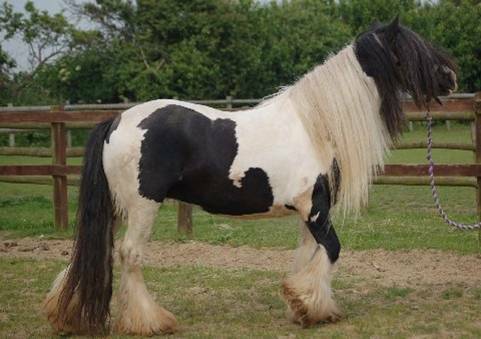 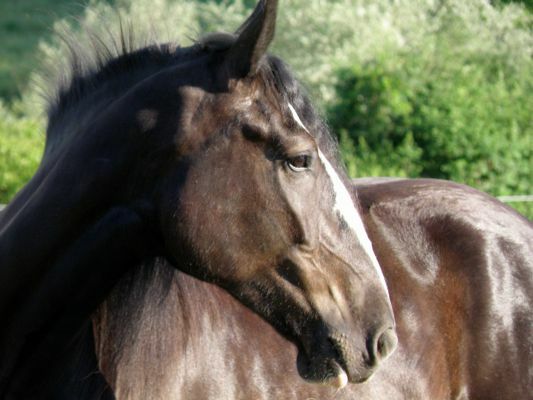 Hope has champion English bloodlines, her sire is the black Shire stallion, Fox Valley Quincy's Zero, and great grand-sire is the Legendary Champion English Bred Shire Stallion, Rhyd-Y-Groes Premier King! 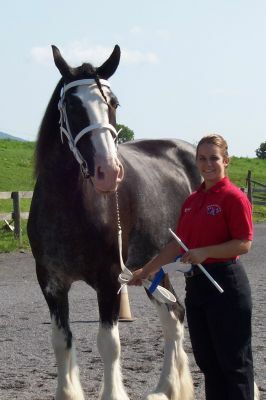 Dam is one of our top Shire producing shire mares, Steege's Beth. 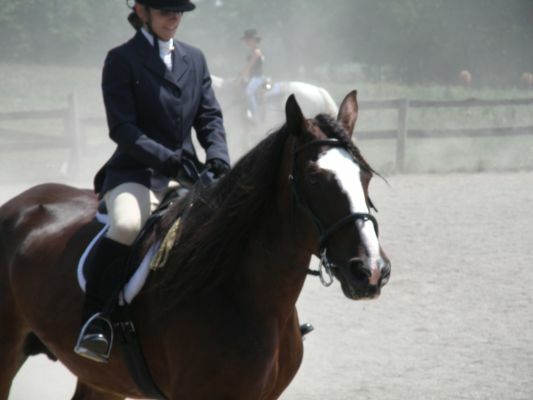 Hope stands 17.3hh and has been professionally trained in Training Level Dressage for the last five years. 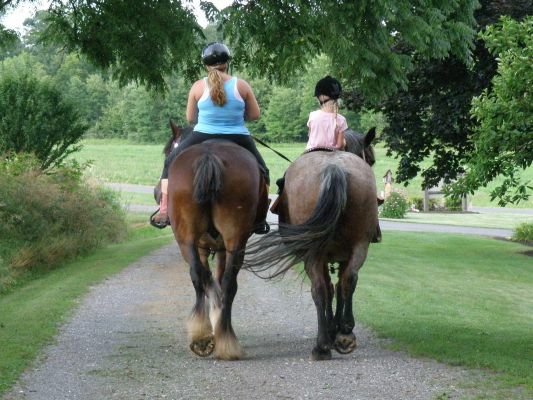 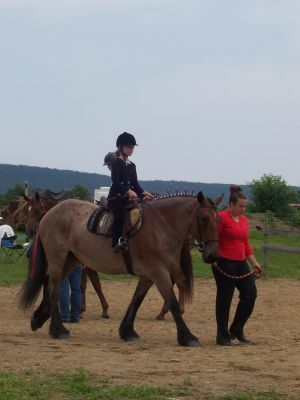 She has three gaits, walk, trot, and canter. 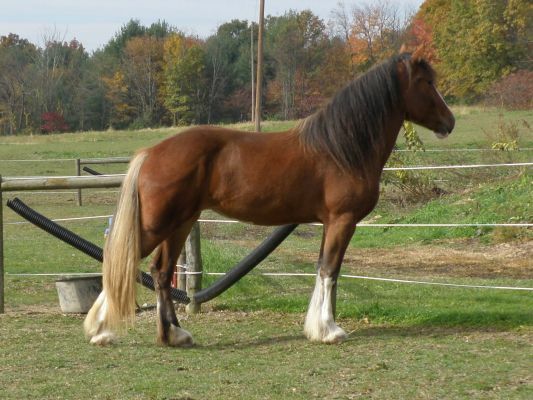 She has excellent conformation, uphill build, long legs, hair to spare, a beautiful refined head and sweet temperament. 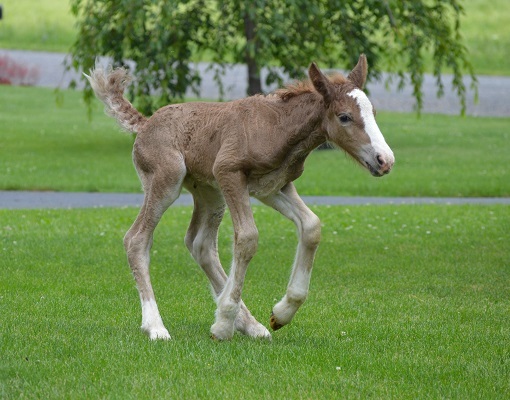 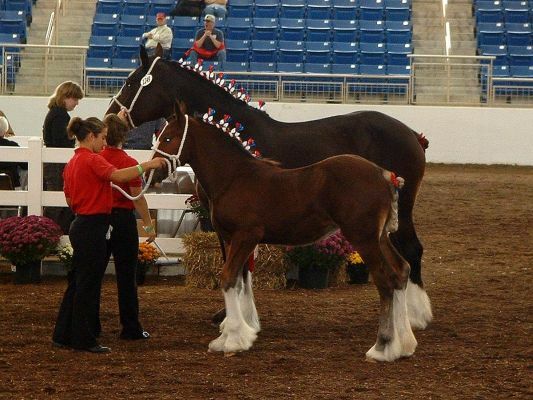 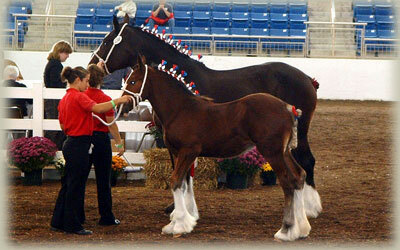 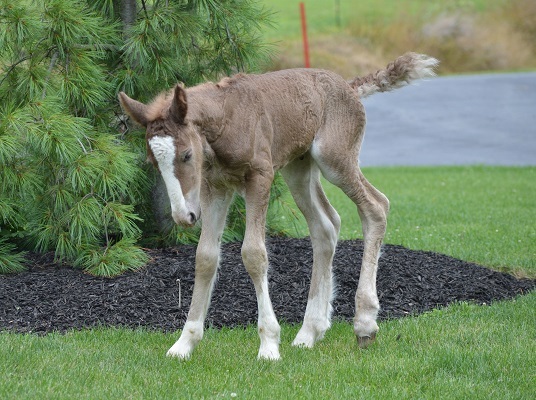 We will use Hope in our breeding program to produce exceptional Drum Horses of the highest quality. 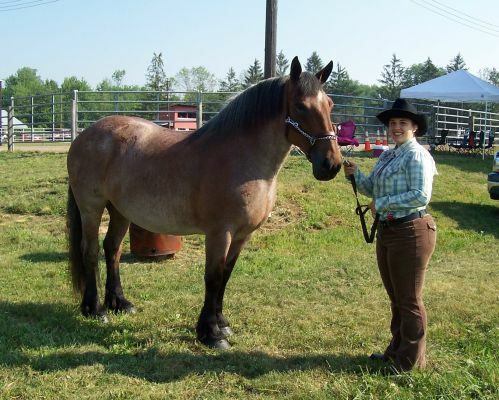 Meet our "Queen of the Herd", Steege's Beth. 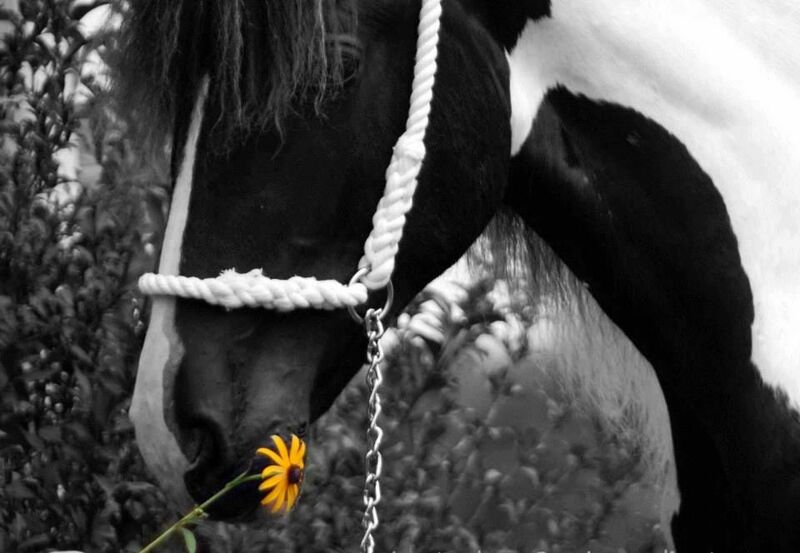 Having a gentle soul, she reigns with great dignity and respect, only using force when necessary. 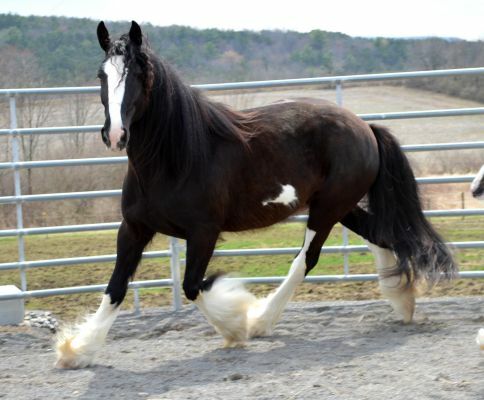 This fabulous lady boasts some of the best shire bloodlines out there. 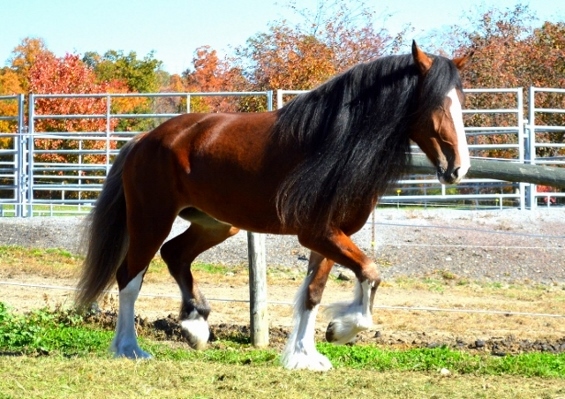 Her sire is Davi Quebec Siboulette, and grand-sire is Legendary Champion English Shire Stallion, Rhyd-Y-Groes Premier King! 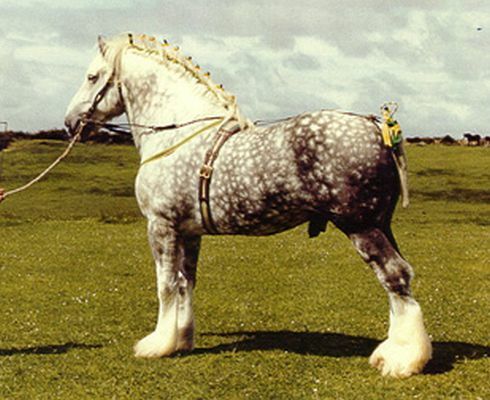 One of the best known grey Shire stallions in England, Canada, and North America, he left a wake of show winnings that are still tough to match! 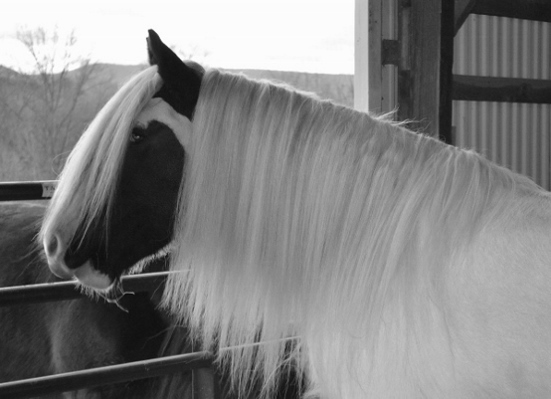 He also possessed one of the most magnificent manes ever seen on a horse, which Beth has certainly inherited. 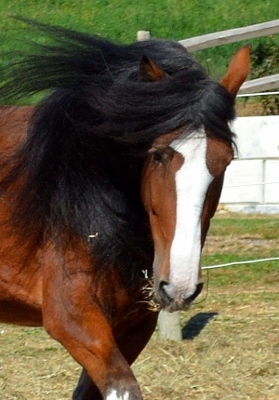 Crazy amounts of hair, a beautiful archy neck, excellent sporty conformation, floaty movement, and a beautifully refined head are a few of this beautiful girl's best qualities. 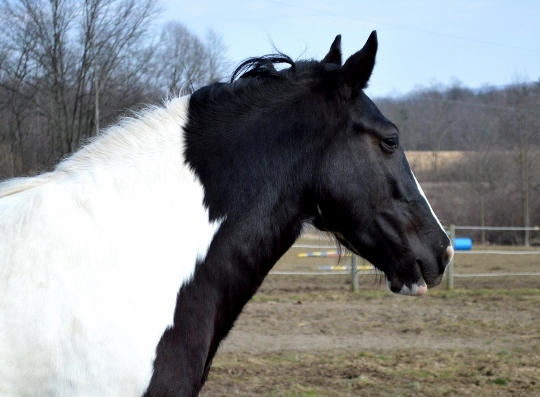 Her docile, good-natured disposition adds to her incredible presence. 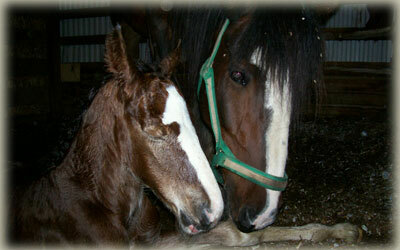 Better yet, she passes on these wonderful traits to her foals. 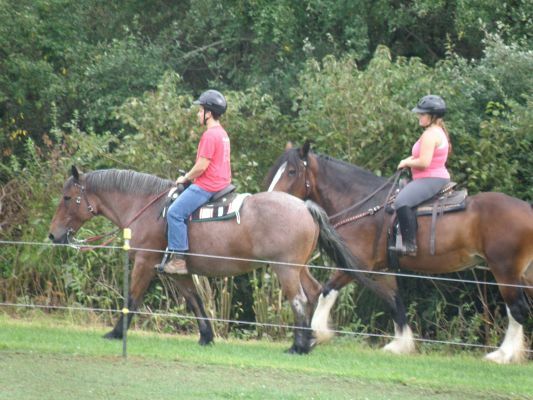 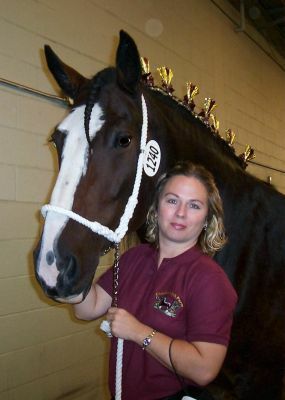 Beth is trained to both ride and drive, and has been used to train youngsters for single, double, and three abreast driving. 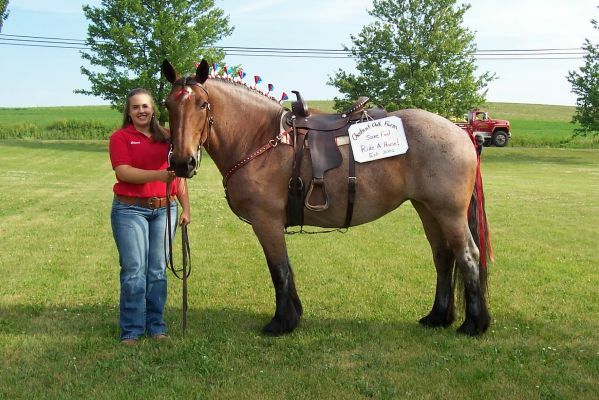 She is also trained extensively in halter and is a four time champion! 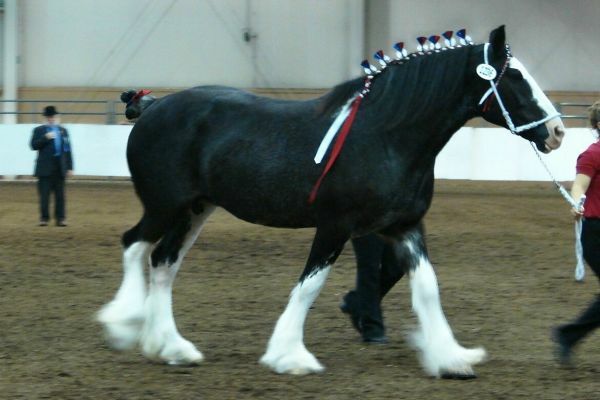 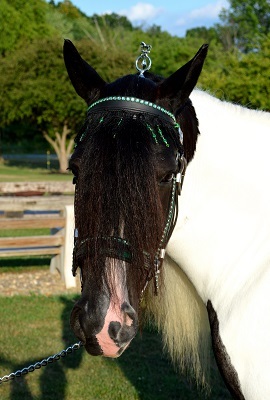 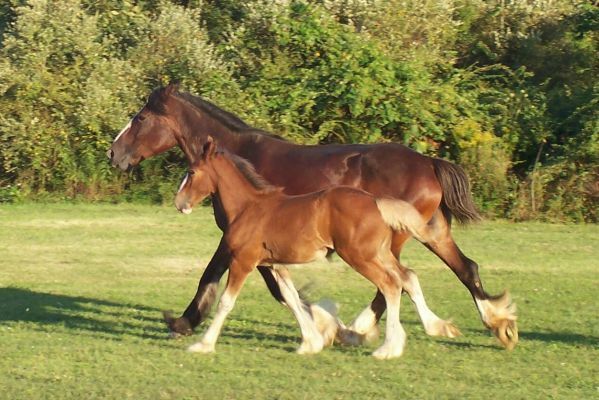 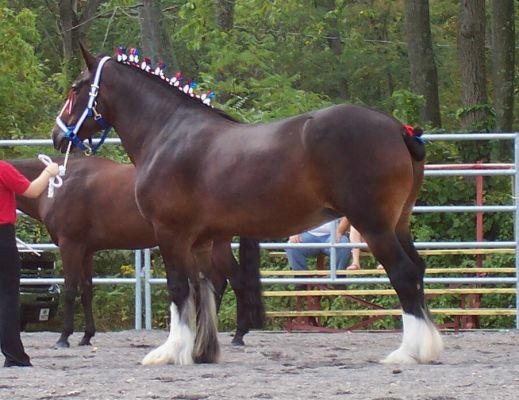 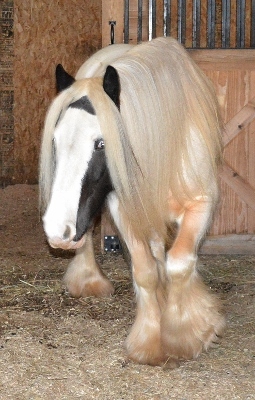 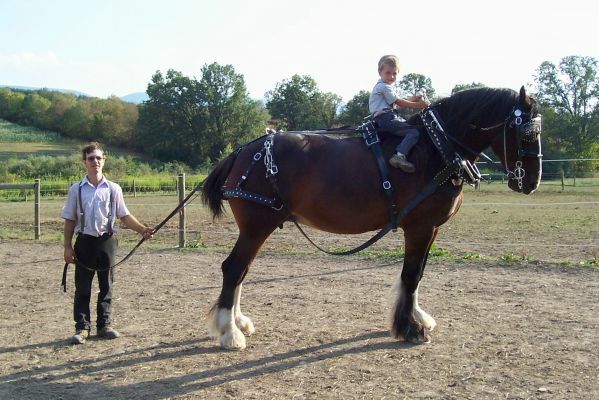 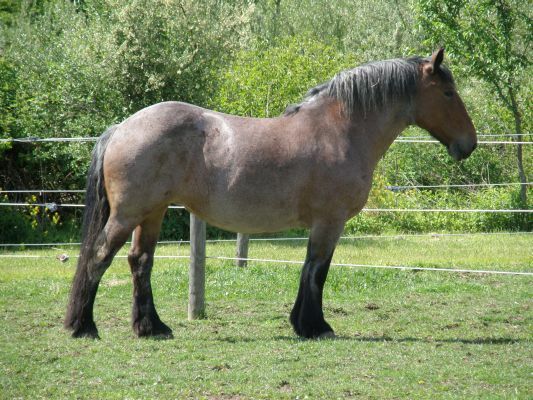 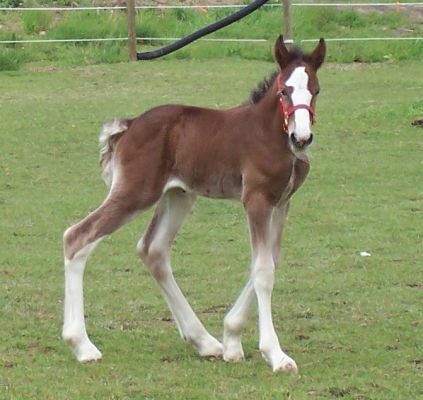 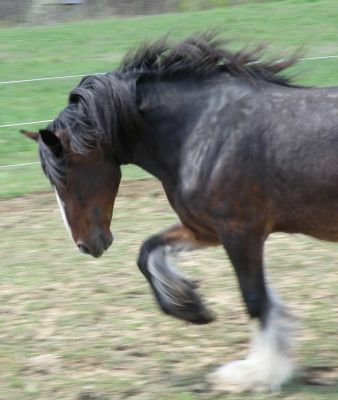 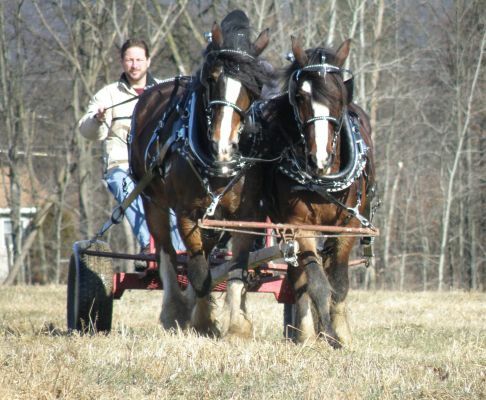 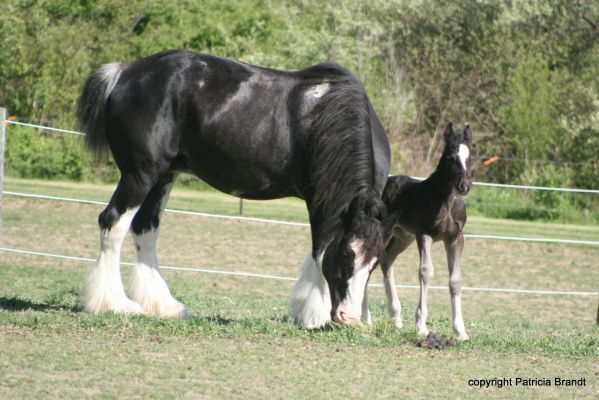 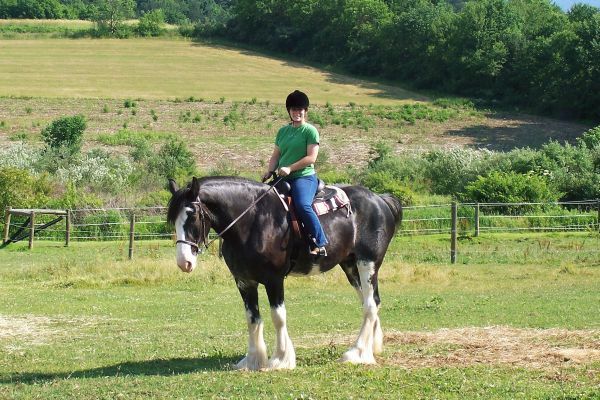 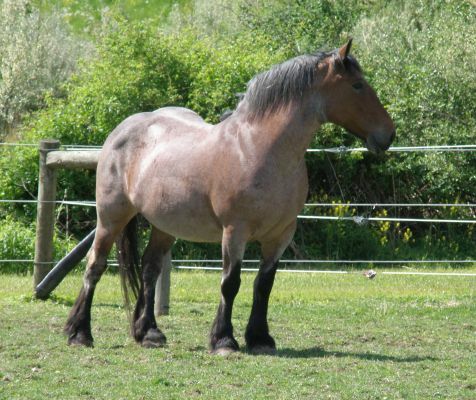 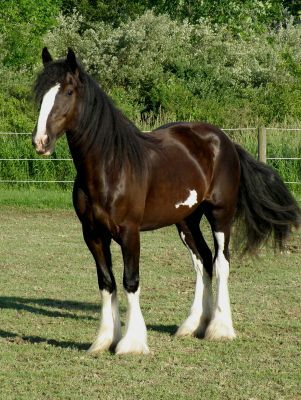 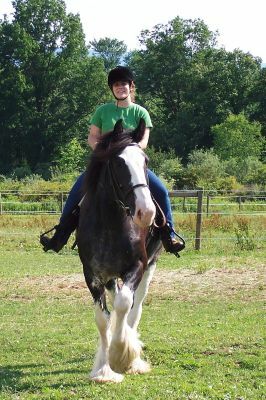 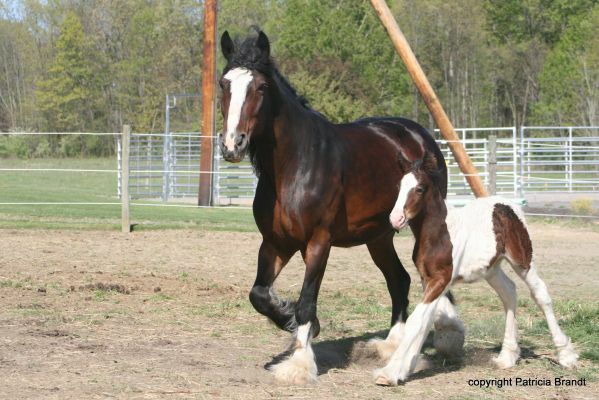 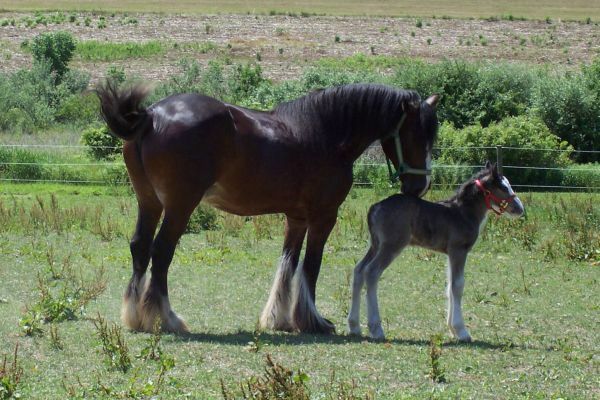 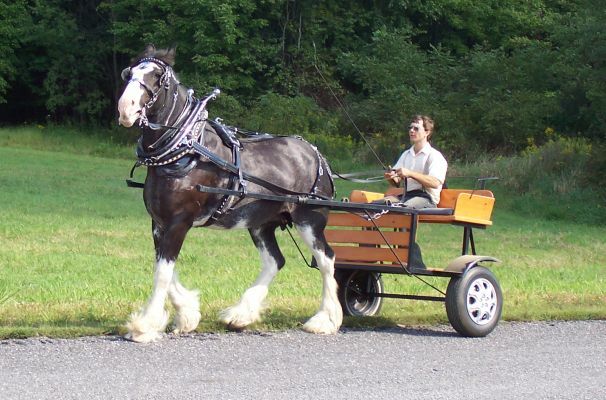 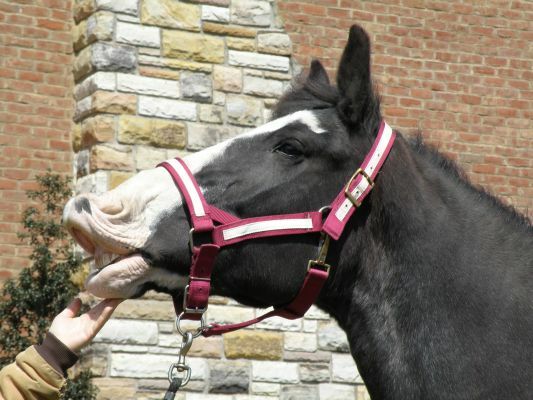 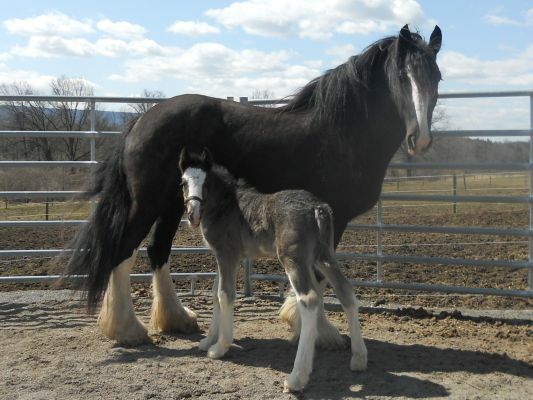 Steege's Zena is our fancy Blue Sabino (roaned) Shire mare with loud white markings. 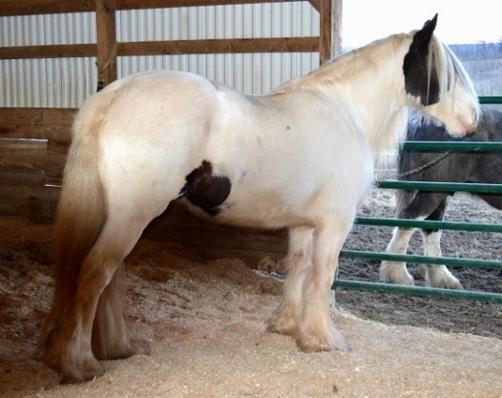 She has a nice wide blaze, white belly splashes, four high white stockings, and even has a white patch on her right shoulder. 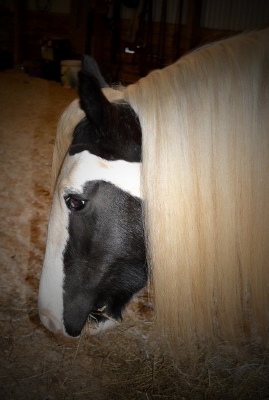 Better yet is her fabulous amount of thick, silky feather! 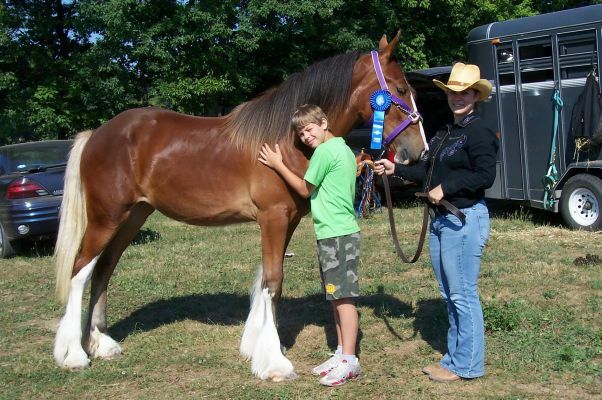 The English judge at the 2007 Regional Shire Show at K.I.L.E., PA commented on how wonderful her feather was! 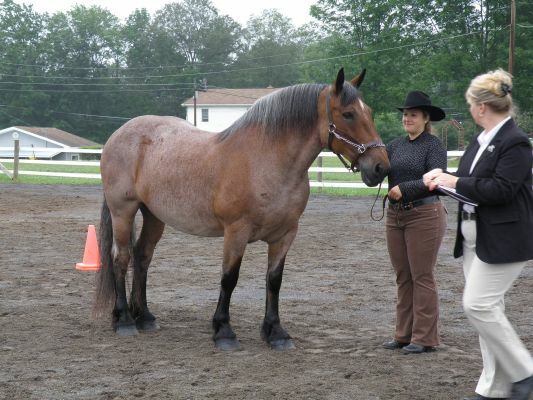 This beautiful mare is very well put together, with long legs, short back, heavy bone, and one of the best set of hocks out there! 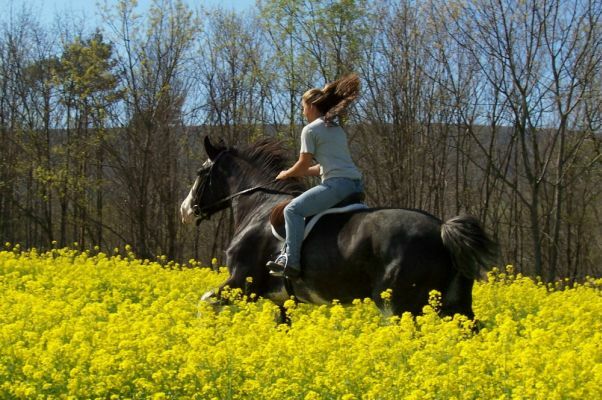 When in motion, this girl has unbeatable action. 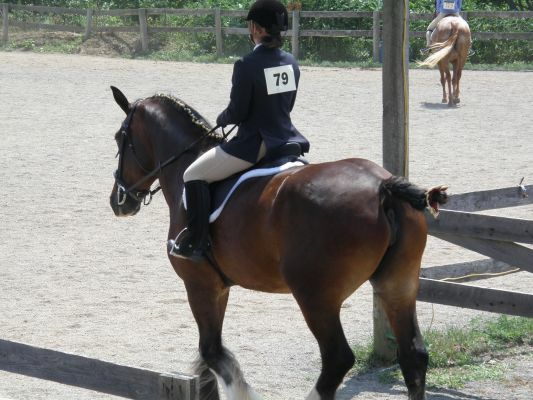 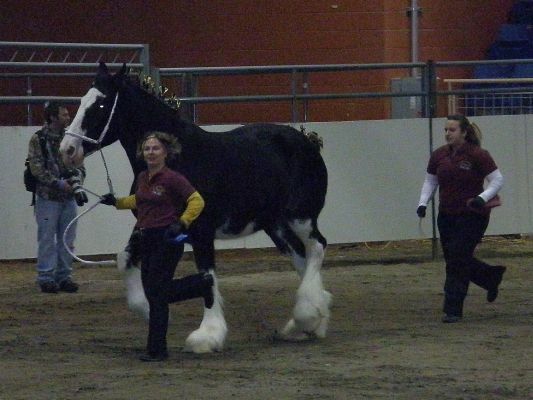 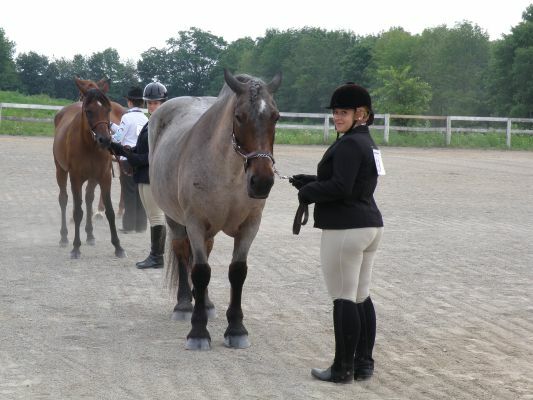 She's very heads up with high knee action and makes great use of her hocks, giving her an extremely flashy appearance! 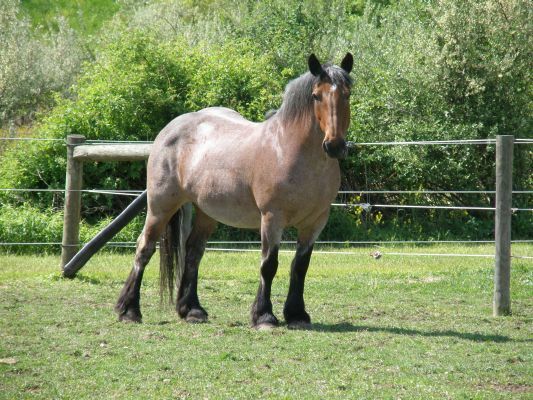 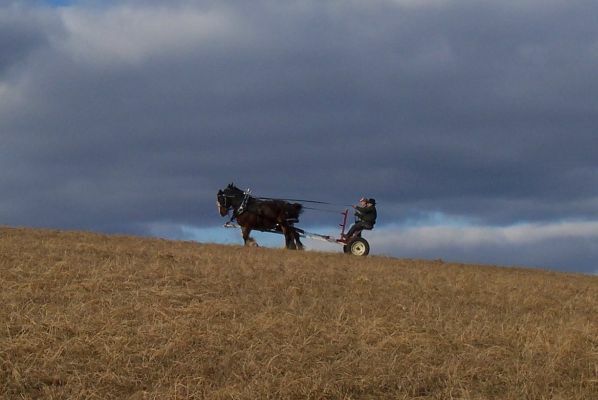 Zena is trained to both ride and drive, but since she is such a wonderful broodmare she has mainly been used for breeding, until recently that is. 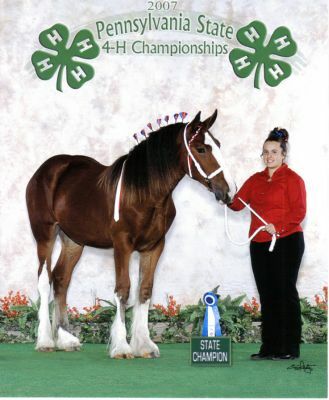 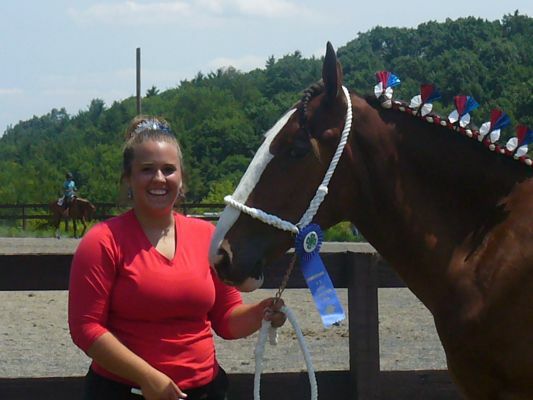 She had her first show season EVER in 2007 and what a season it was! 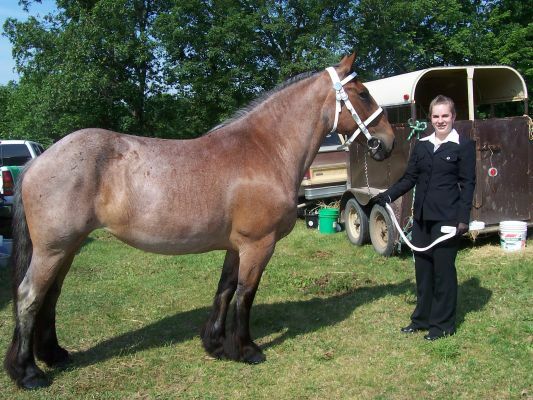 At her first show in August she won 1st place in Open Halter in a class of 9 entries, all light breeds. 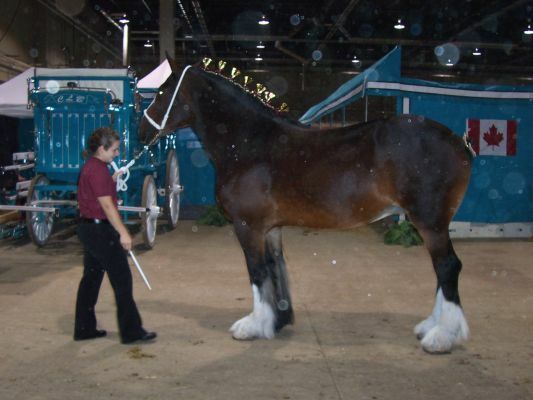 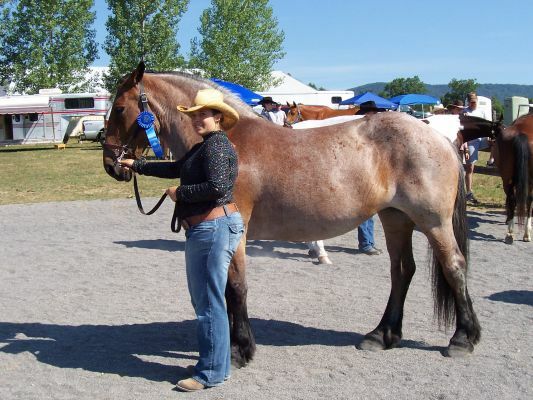 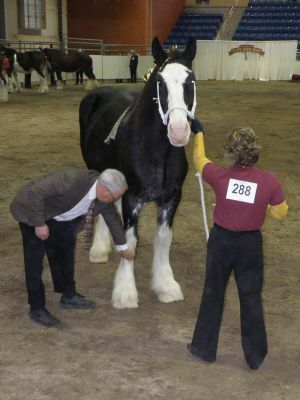 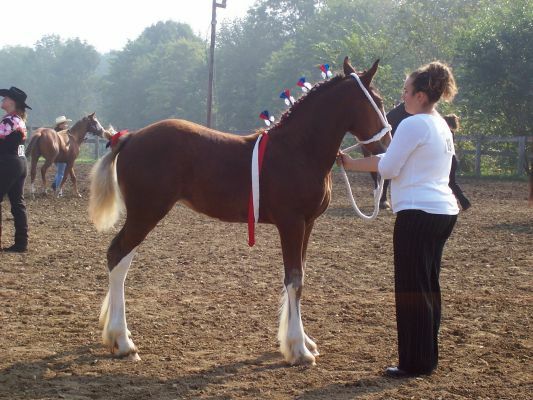 Then in September at the Beaver Fair she again won 1st place in Open Halter in a large class of light breeds, going on to win the 2007 Grand Champion Halter Horse! 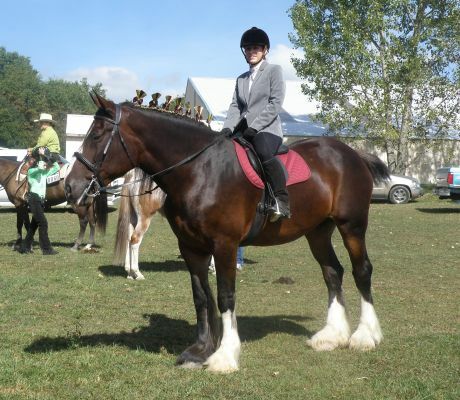 Finally, we took her to the Regional Shire Show at K.I.L.E. 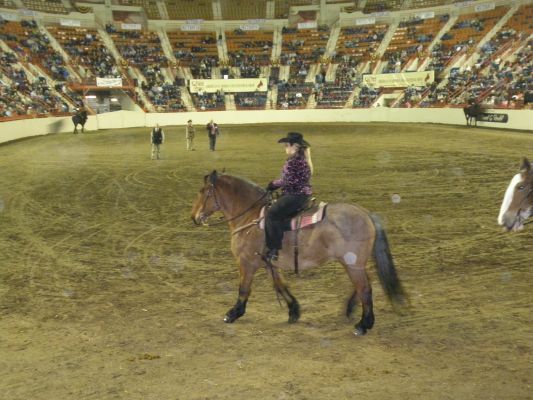 in Harrisburg, PA where she was entered in the Yeld Mare 4 yrs. and older class. 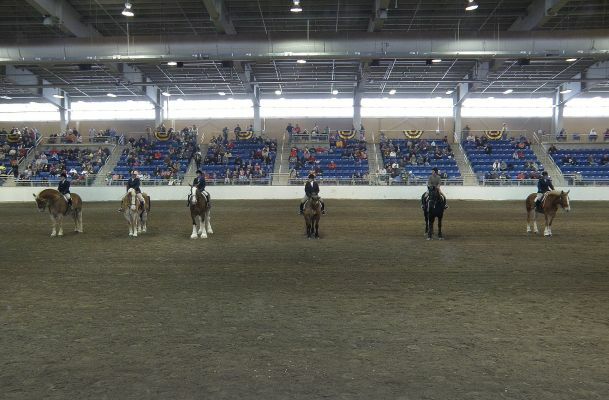 The competition was very tough with 11 entries and the judge traveling from England this year. 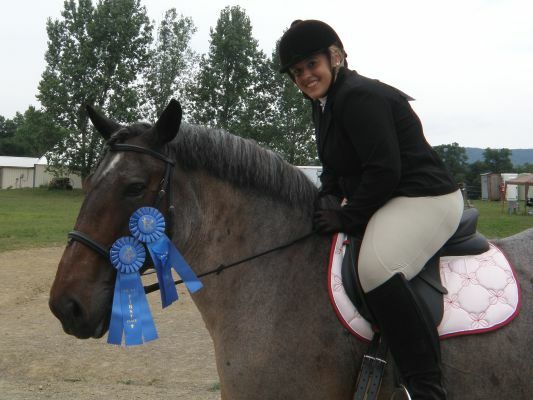 Zena won 6th place and did an excellent job. 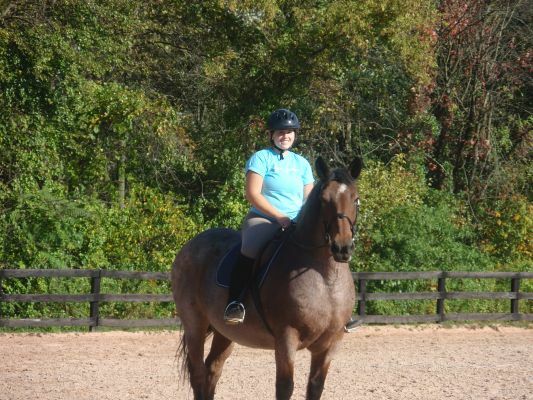 We are so proud of her and look forward to showing her in driving/riding classes in the future. 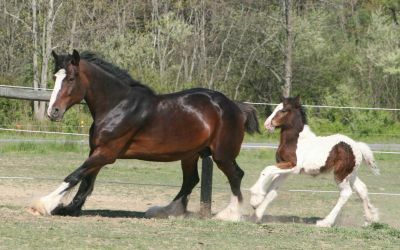 TRAINING: You name it, she has done it! 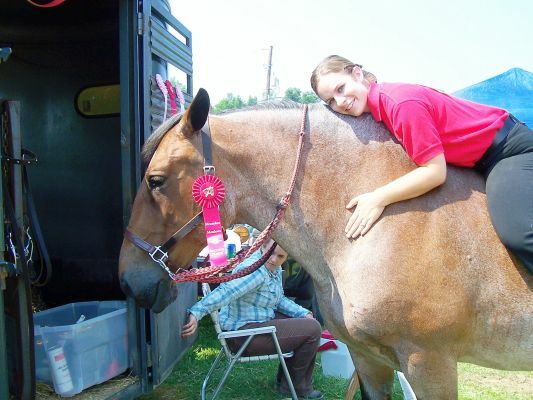 RIP ROSEY GREY...GONE...BUT NEVER FORGOTTEN...Rosey Grey was at Wilson College in Chambersburg, PA, with our daughter Olivia for four years. 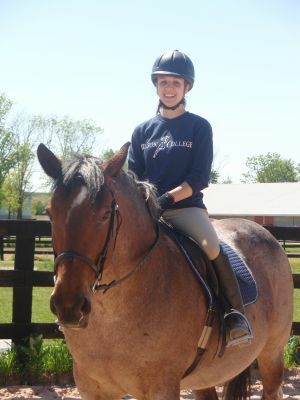 This highly versatile girl was part of Wilson's Equestrian Team and participated in Drill Team, Dressage, Western Team, and Hunter/Jumper! 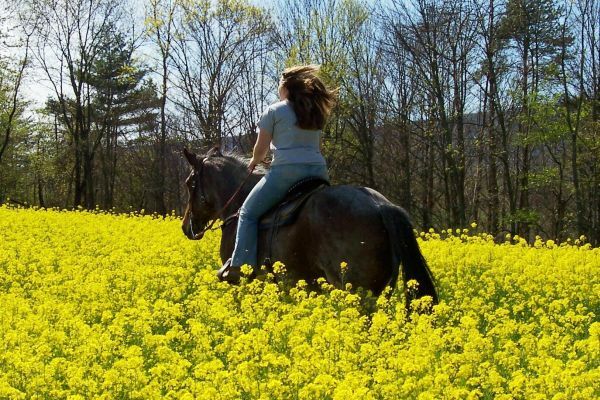 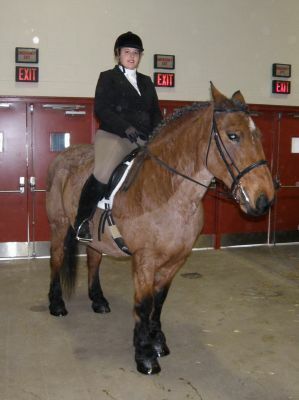 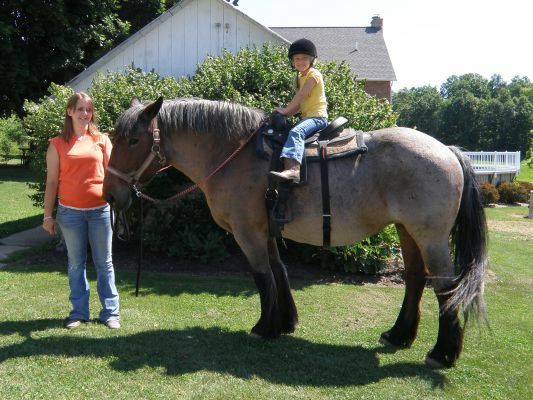 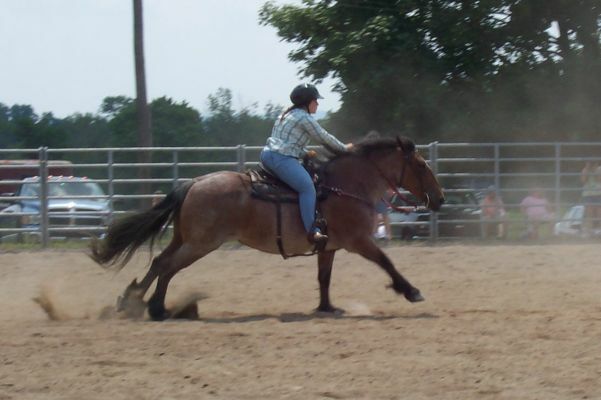 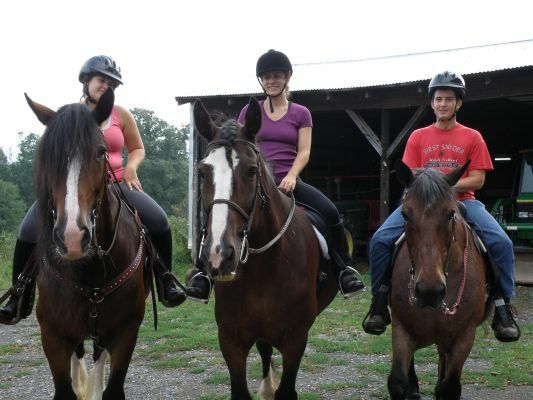 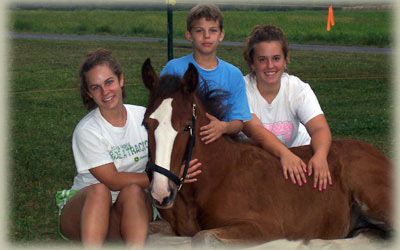 She was also used in Wilson's Therapeutic Riding program as well as a lesson horse. 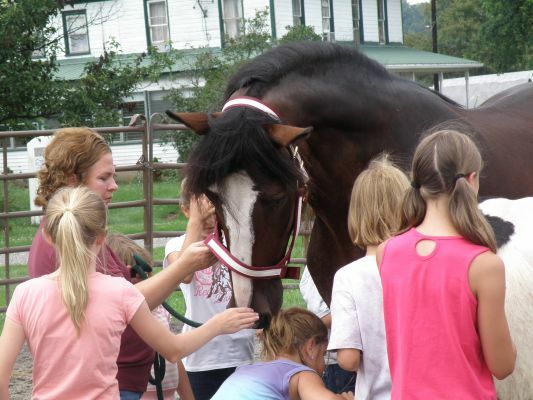 She is quite adored by the Wilson staff and students! 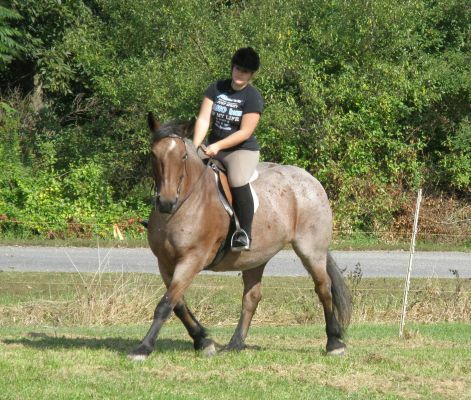 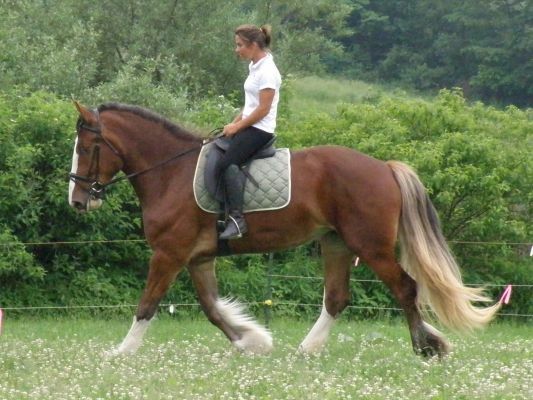 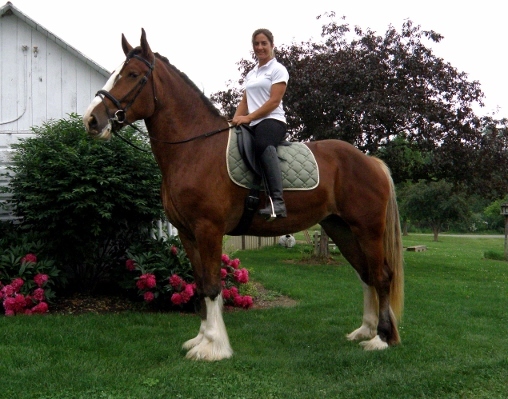 Rosey is a Brabant Belgian and perhaps our most versatile and well rounded horse. 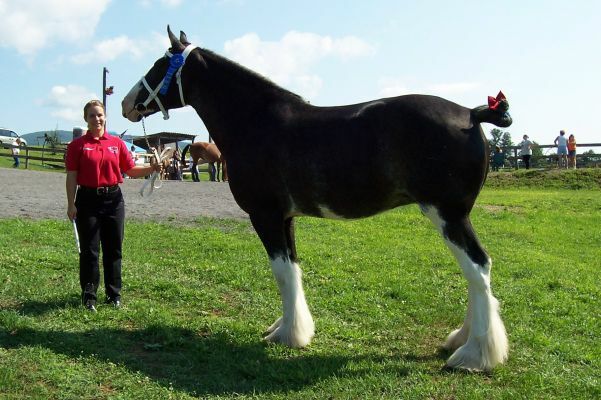 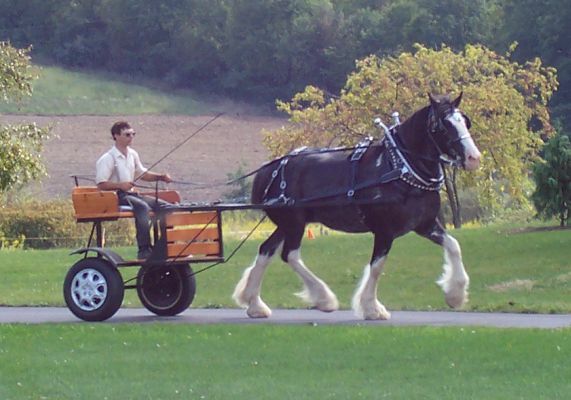 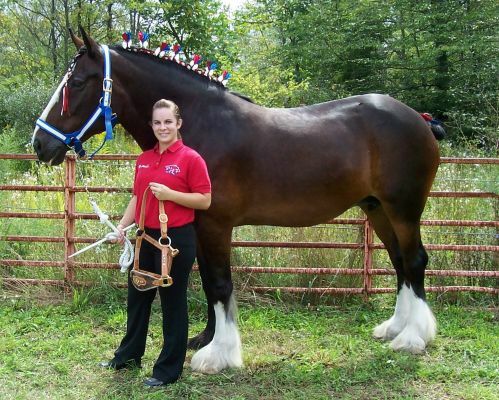 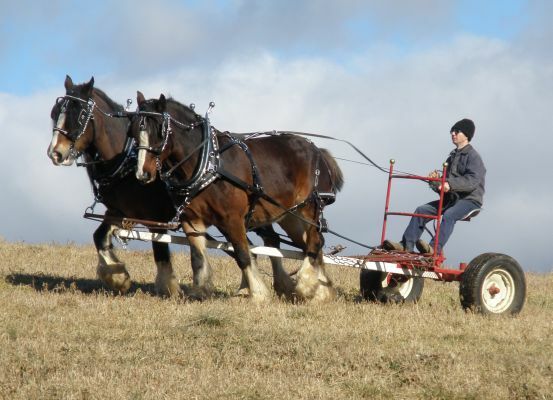 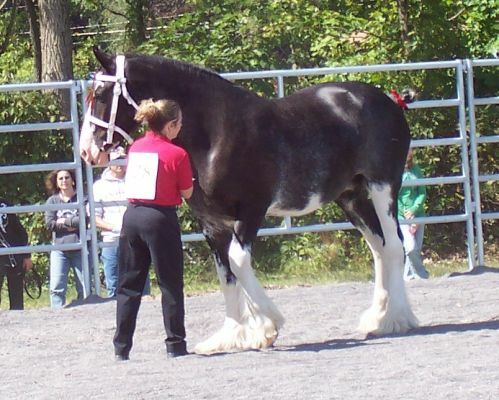 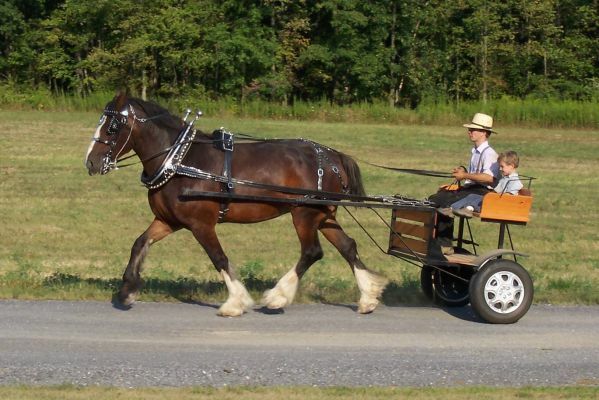 Brabants or European Belgians are the foundation horse for the American Belgian and are the gentle giants of yesteryear. 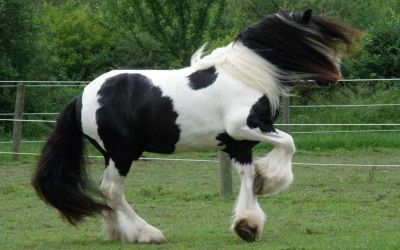 They are rare and bred primarily in Europe. 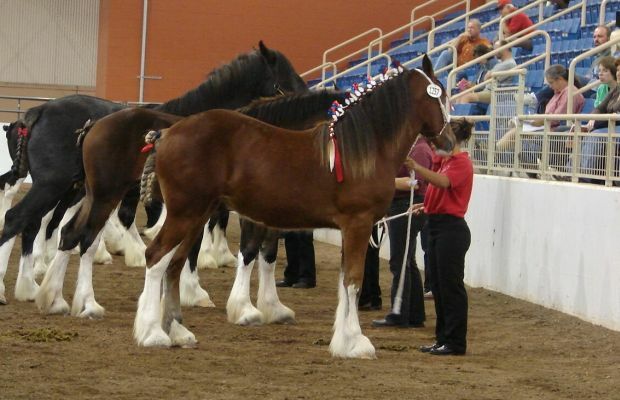 To find more out about this exciting breed visit our "Breeds" page. 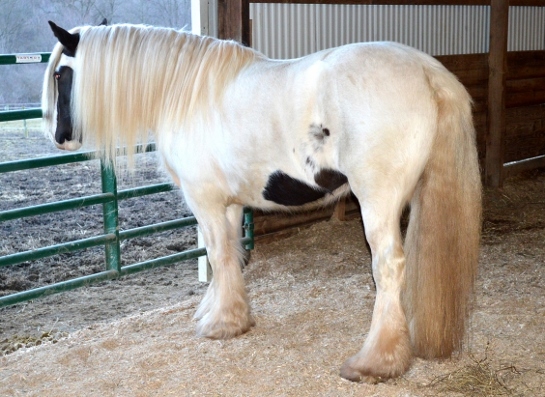 Rosey is a unique bay roan color with jeg black feathered legs and a small white star. 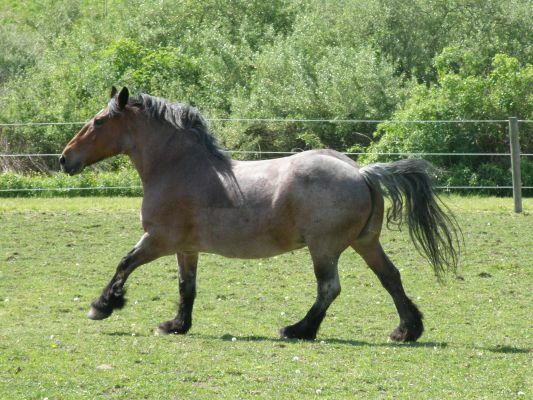 Although she isn't registered (due to lack of parenting information), she is certainly a great example of her breed, with an immensely thick, short neck, broad chest and shoulder and a very strong, muscular build. 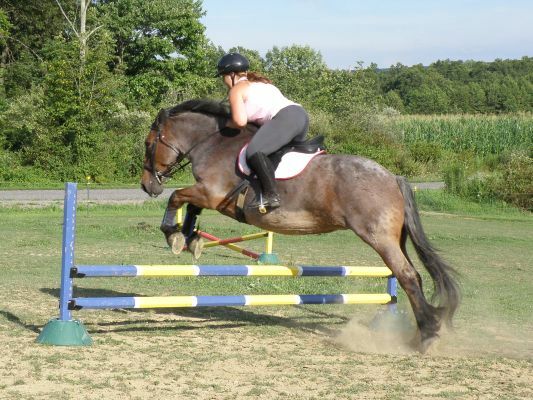 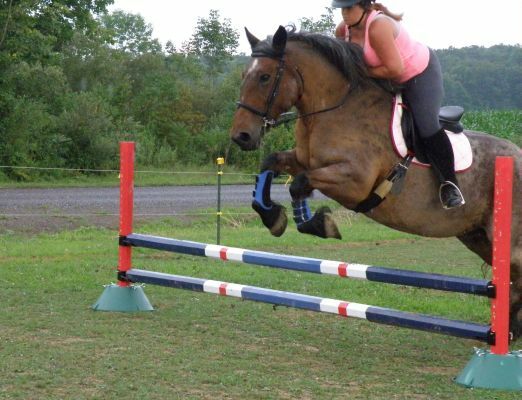 Rosey is a great athlete, trained extensively in halter, english/western pleasure, hunter, jumping, dressage, driving, trail riding, and even gaming! 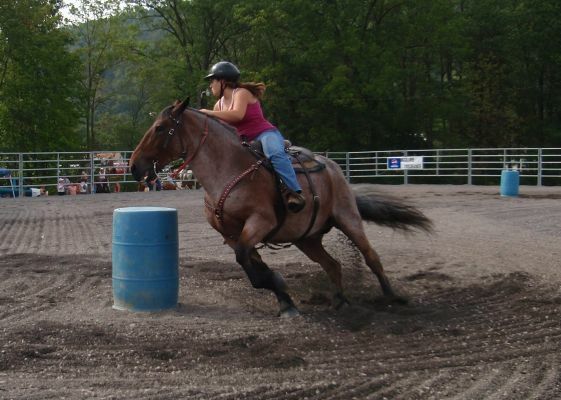 She competes in barrel racing, keyhole, pole pending...against light breeds...and wins! 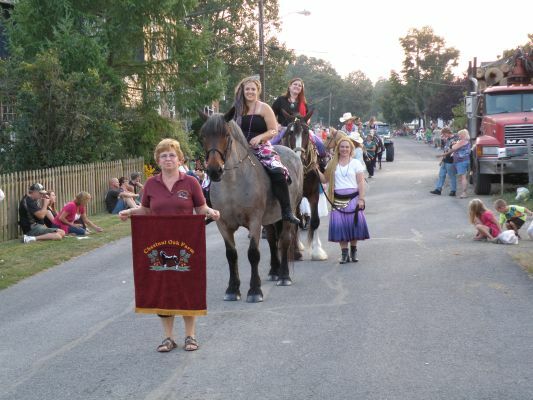 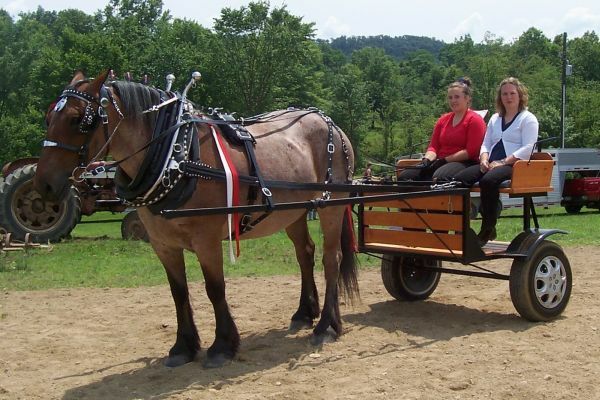 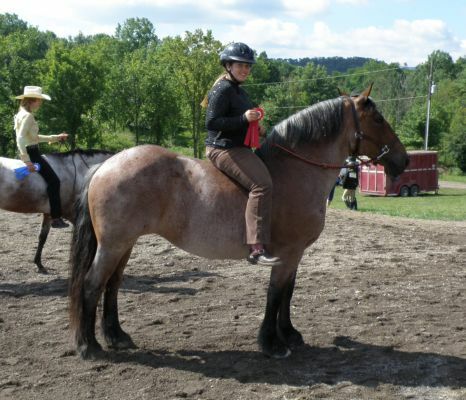 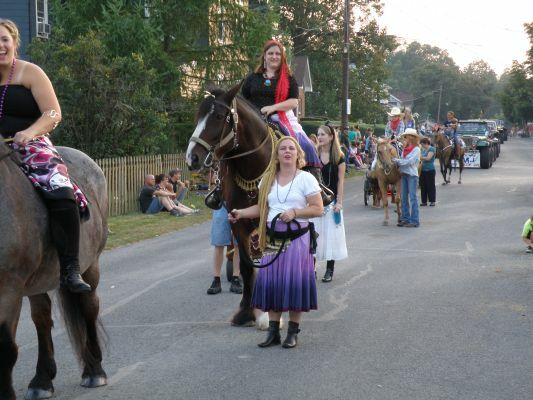 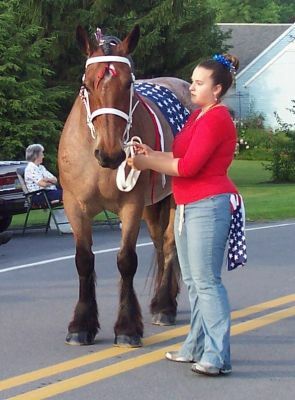 She also participates in parades and was our daughter's 4-H horse. 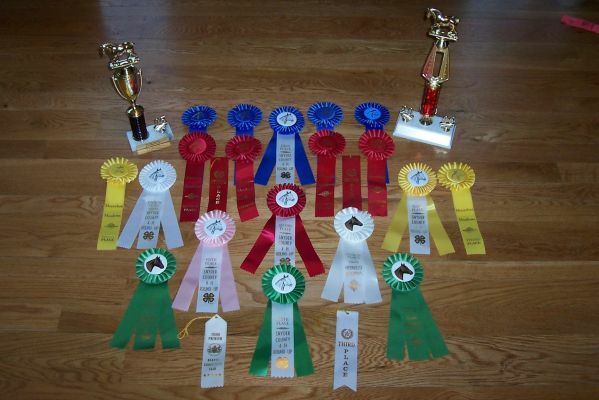 This versatile girl has won more ribbons than we can count in her show career. 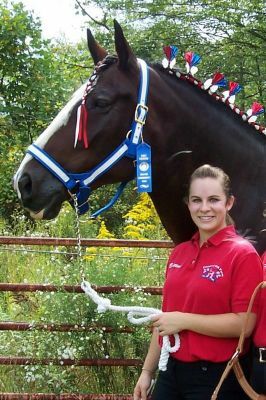 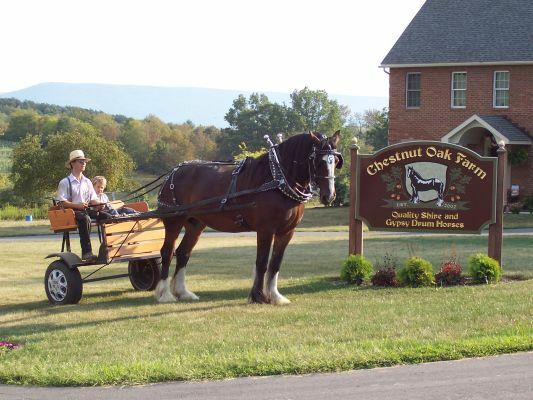 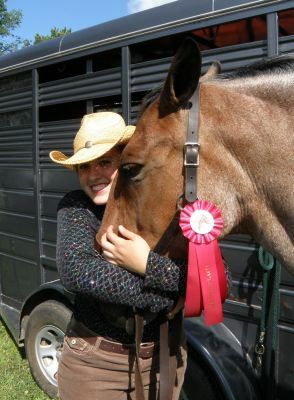 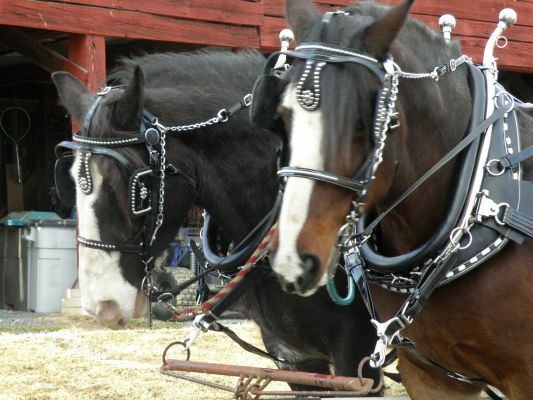 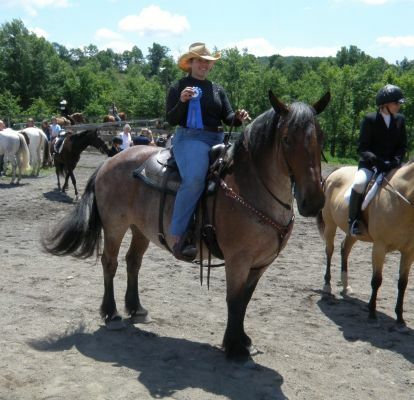 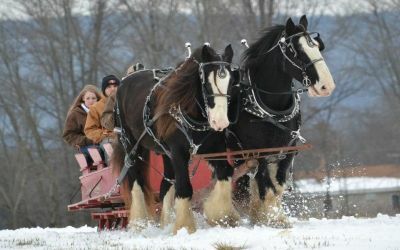 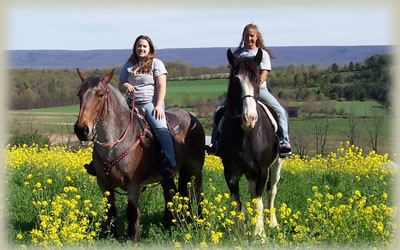 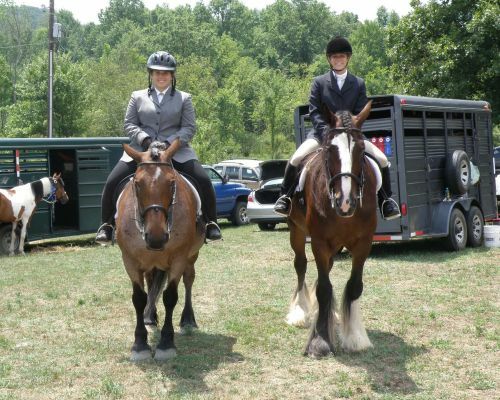 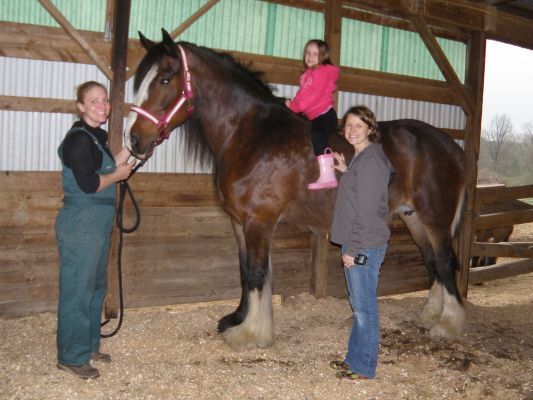 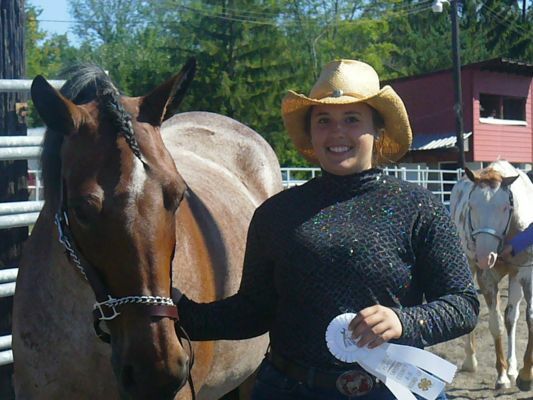 She and Olivia have even participated in the 2011 Open Draft Horse Show at the PA Farm Show, bringing home a 5th place in Western Riding! 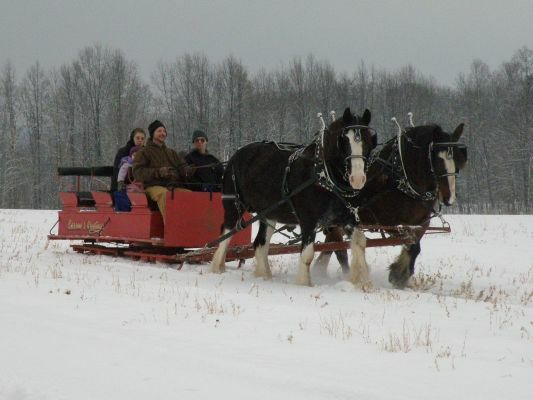 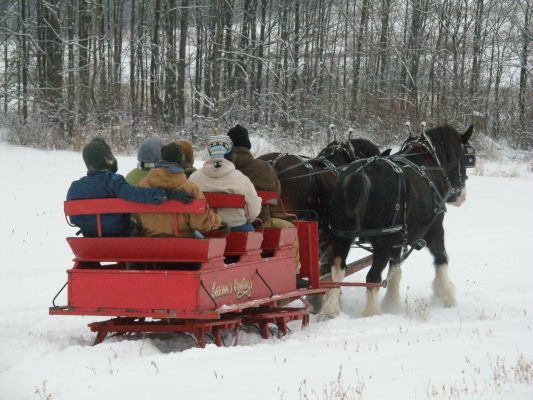 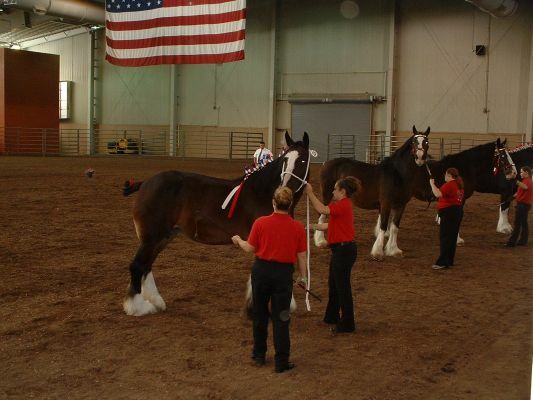 Rosey is usually the only draft horse at the open shows we attend so attracts attention wherever she goes and is a crowd favorite. 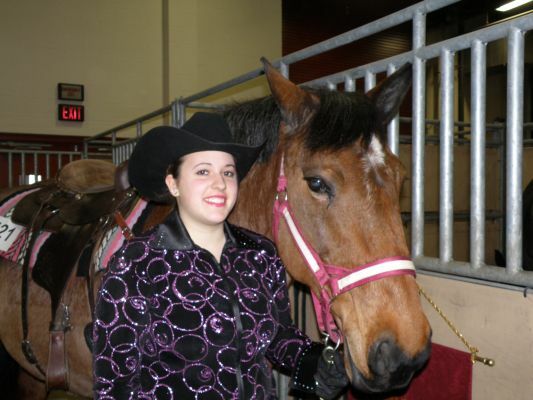 People are simply drawn to her. 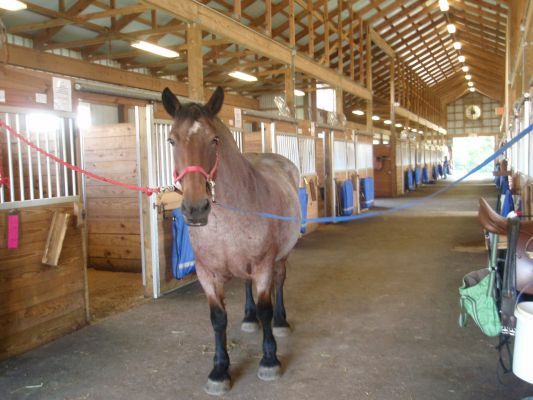 Rosey now enjoys being a lesson horse at Chestnut Oak Farm. 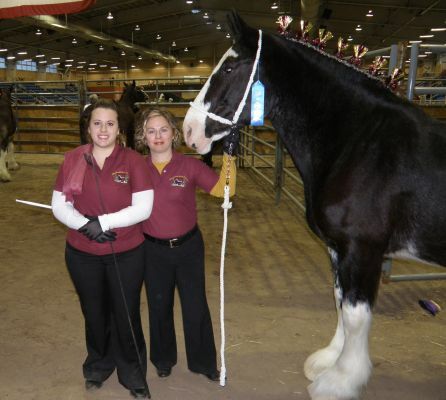 As if being a rare breed and do-it-all show horse weren't enough, this girl is also a CELEBRITY HORSE and was owned by WILBUR RIMES of Texas! 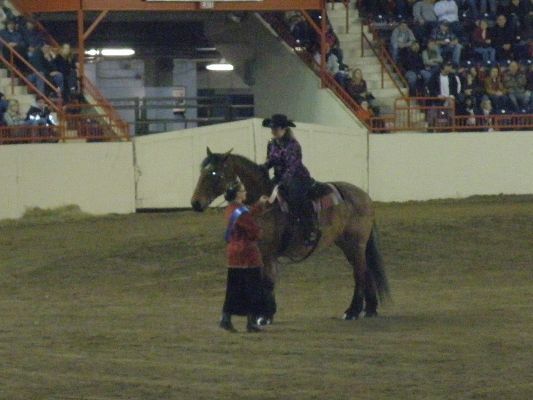 Yes, that's LEANN RIMES' dad! 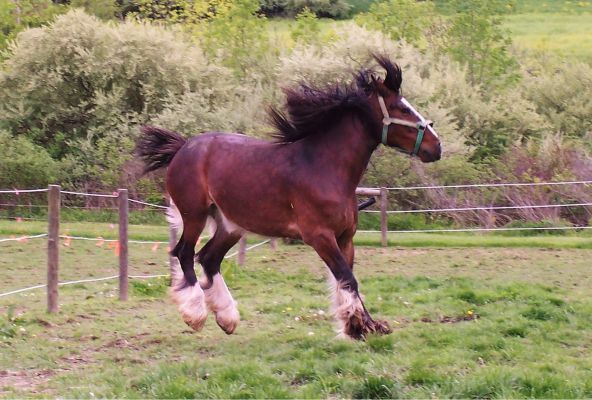 We feel very lucky to be able to own this unique mare. 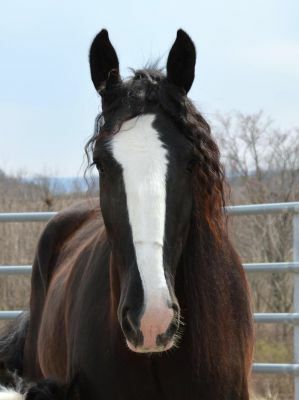 Meet our exquisite black shire mare, Lady Sara's Dottie. 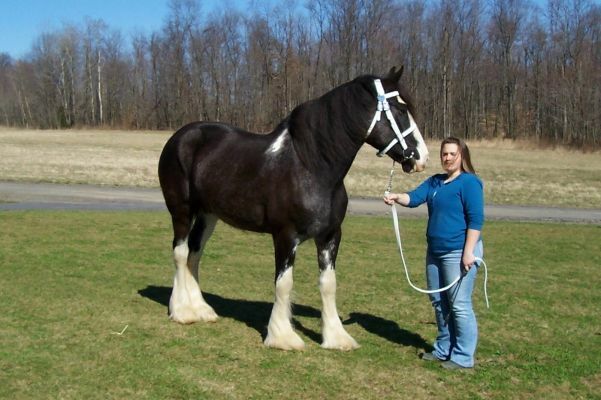 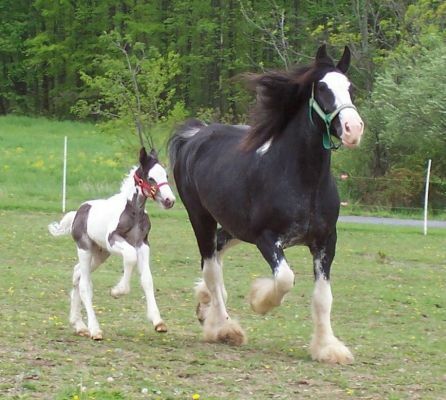 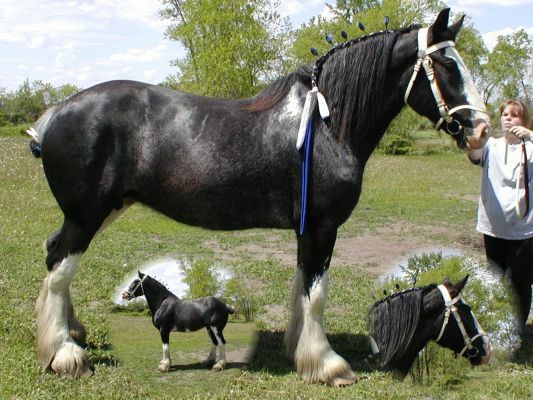 The perfect example of her breed, Dottie boasts some of the best shire blood out there. 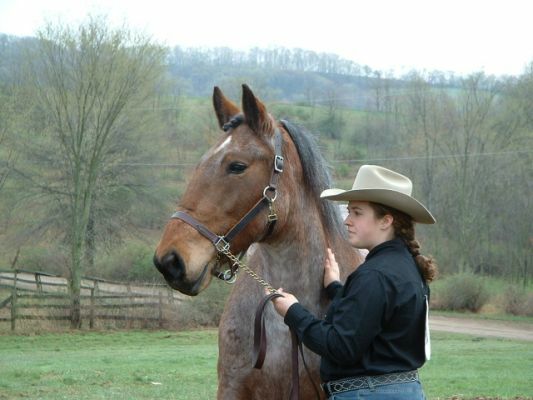 She is by Forest Hills Bremer and out of Brightenridge Sara's Gromit, with Star-Knight Excaliber and Dua He Chi's J. R. in her bloodlines. 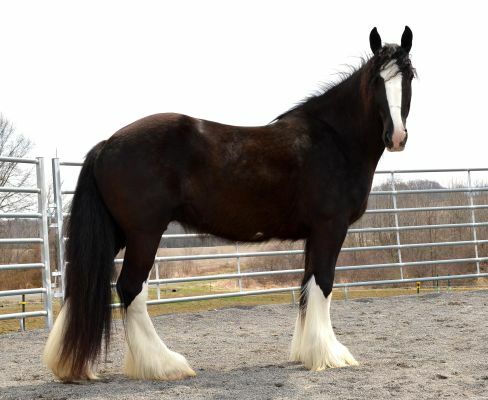 Elegant and regal in appearance, this lovely lady has a fabulous heads-up, uphill build, excellent conformation, great size, clean bone, thick feather, and a super gentle temperament to boot! 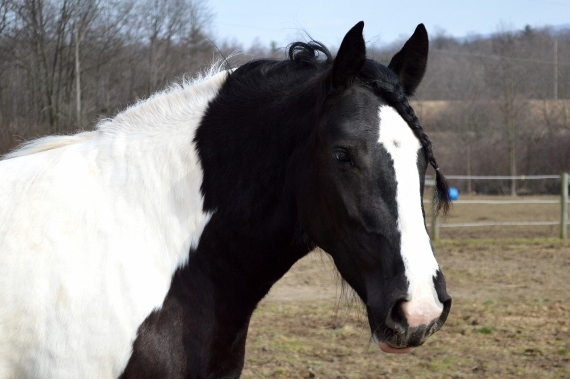 She has four perfectly matched stockings, a nice blaze, and even sports a large white spot centered on her left side, hence the name, Dottie. 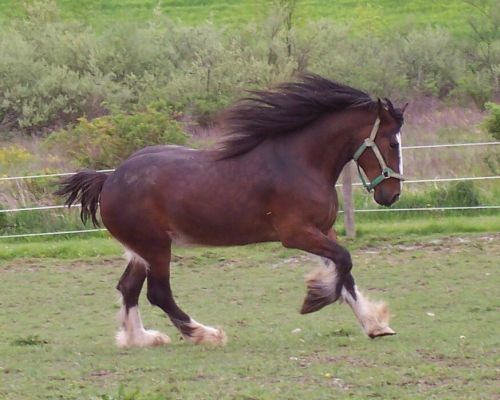 She has a super smooth trot with both extension and knee action giving her great animation when moving. 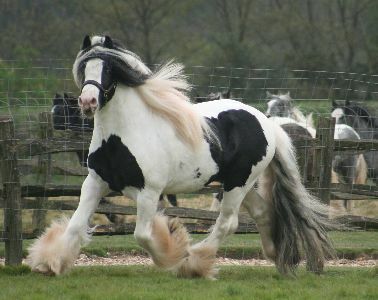 She truly is beauty in motion. 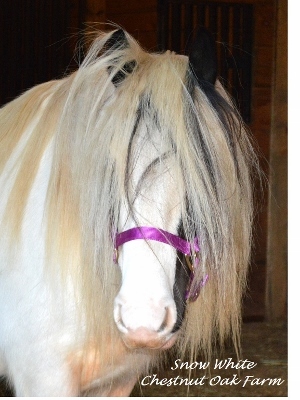 We will be using Dottie for our breeding program as well as showing and promoting her.